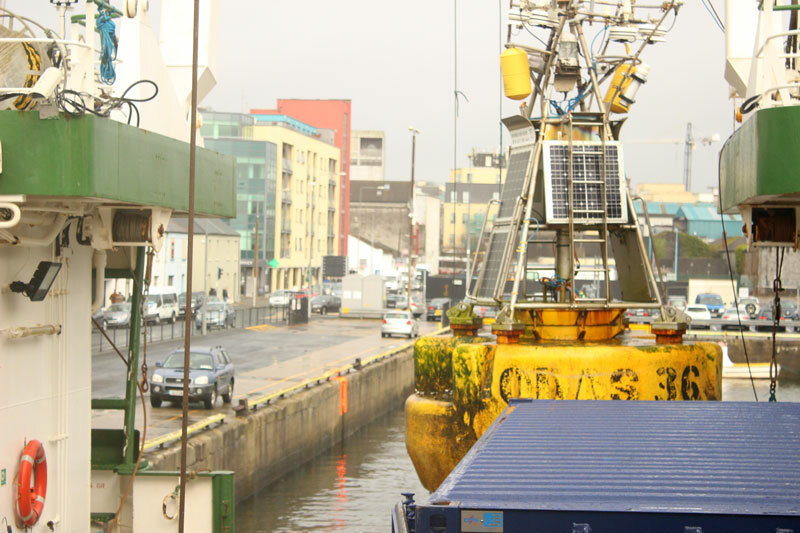 We arrived at the port of Galway at 9 am. It was a peculiar feeling to see boats, buildings and cars where an endless ocean had been for so long. As soon as we had arrived in, preparation for the Celtic Explorer‘s next mission had already begun. 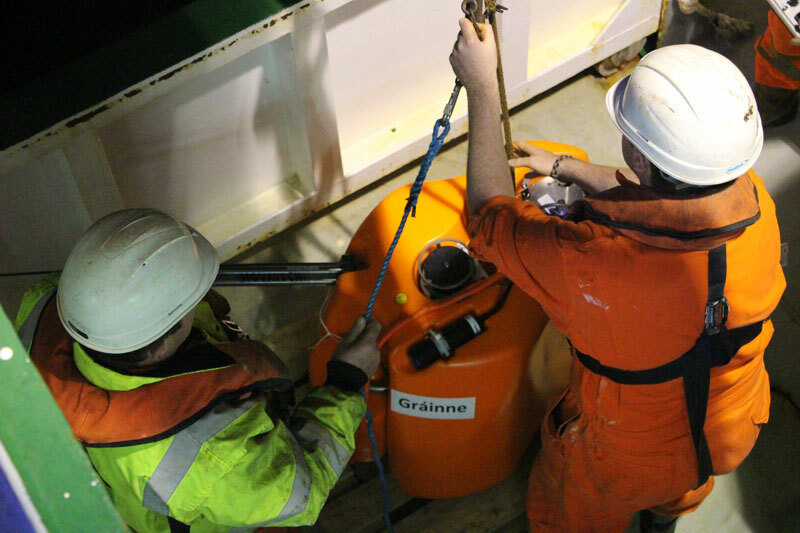 The whole ship became a hive of activity; loading and unloading, repairs and maintenance, restock and restore of all the essentials for life and science at sea. 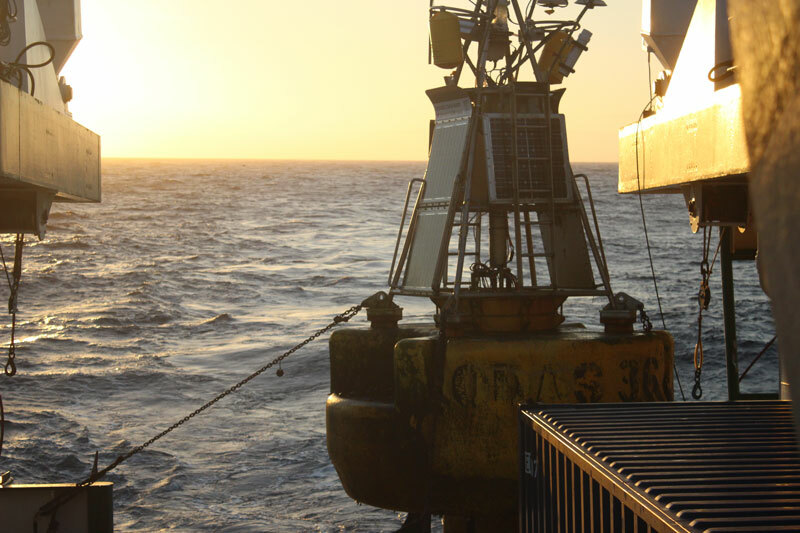 And with that, the SEA-SEIS team had completed their mission to deploy 18 seismometers to bottom of the Atlantic ocean where they will record sounds from deep beneath the earth for the next year and a half. 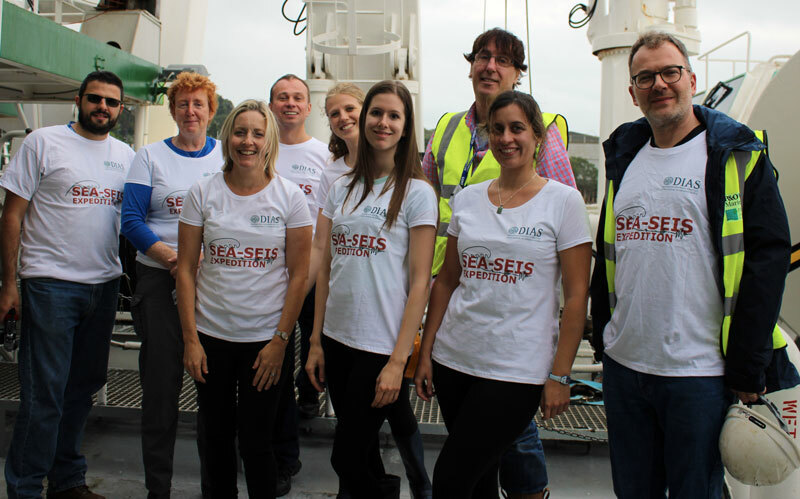 The SEA-SEIS team Thanks for following our mission! A successful mission thanks to many partners working together to conduct some incredible science. We hope you’ll all join us again when we venture out on the retrieval mission in 18 months time. 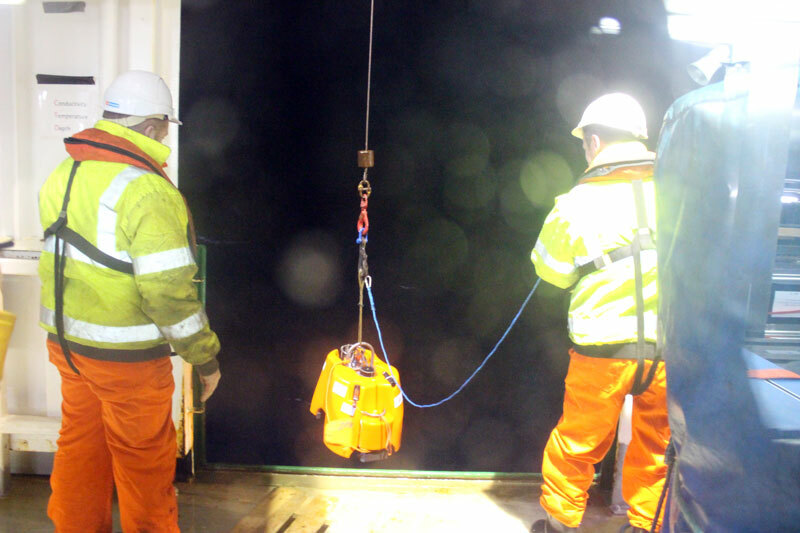 An early start this morning for the crew as they retrieved the M6 buoy. We’re now homeward bound, expecting to reach the port of Galway tomorrow morning. A big day! We deployed our final seismometer this morning. But first, there was another deployment. 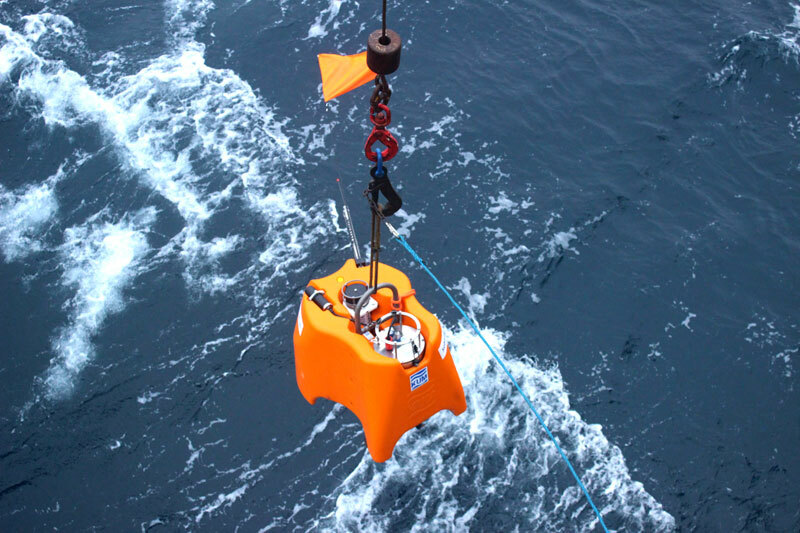 A buoy that will measure the sea condition at various levels of depth of the Atlantic Ocean. 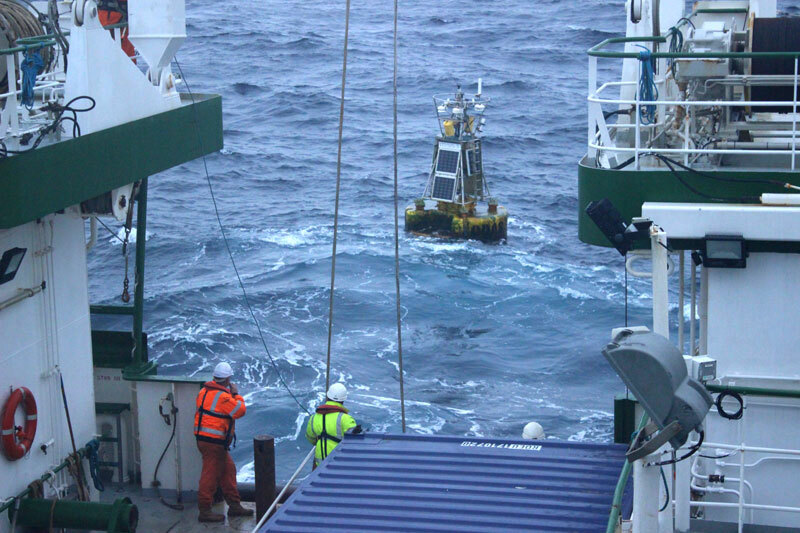 The crew prepare for the deployment of the buoy. 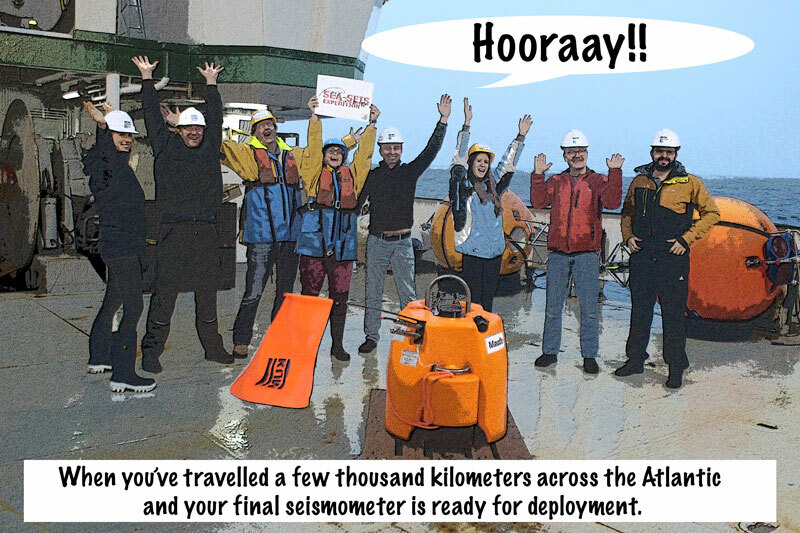 Before we deployed Maude (seismometer 18), we gathered for a photo on the deck. There had been talk of graphic novel style images. I can only apologise for this attempt. 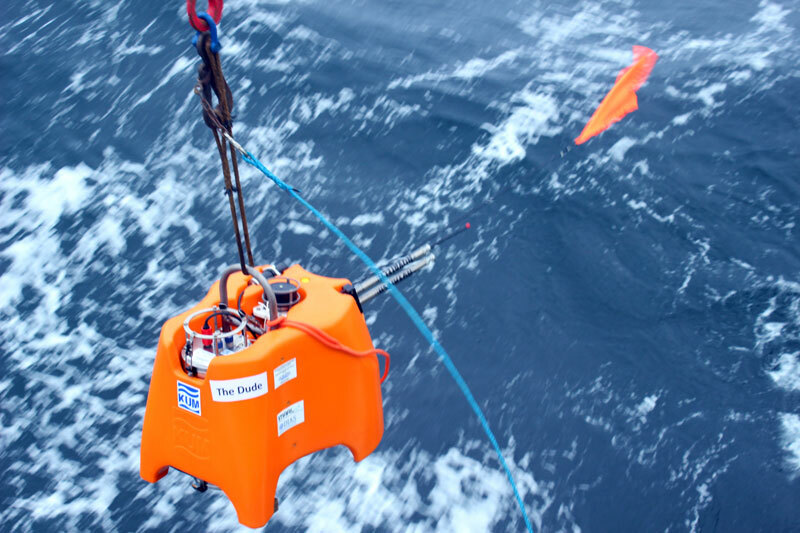 Maude, the final seismometer, was deployed at 8 am. Named after Maude Delap, the inspiring Irish marine biologist. The name was the winning entry by the 2nd year science class at St Joseph’s College, Lucan, Co. Dublin. And just like that, Maude was gone. 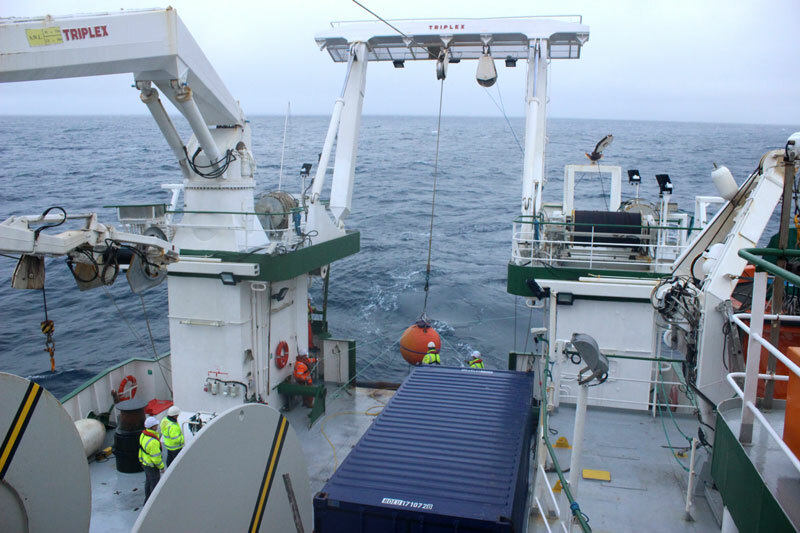 18 seismometers have now been sent to the bottom of the Atlantic Ocean to gather data for the next 18 months. 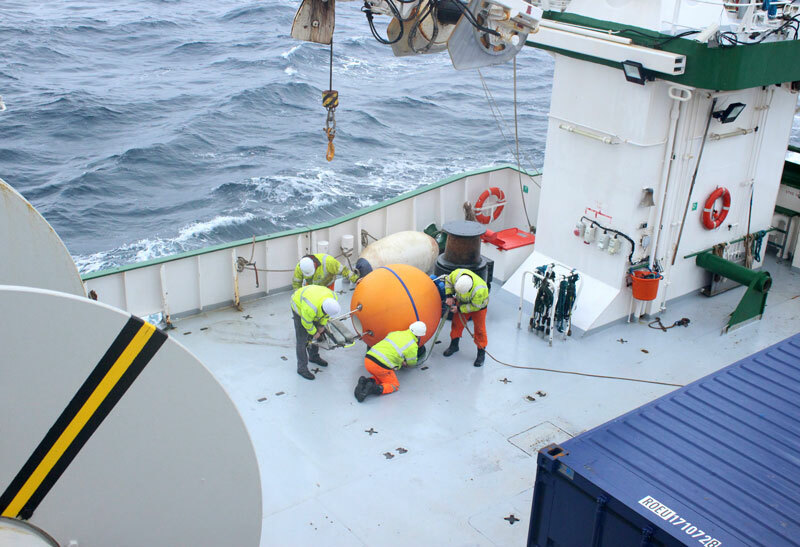 We now are returning home to the port of Galway, it’ll take at least a day, and on the way, we have a rendezvous early in the morning with a buoy that has managed to slip its mooring and has been adrift for a while. I’m interested to see what kind of state it’s in so for sure will be up early for that. This morning we woke to a thick, ghostly fog all around the ship and it has stayed with us all day. I had to do a quick google for my own understanding to determine the difference between mist and fog, and it’s all about visibility. If visibility is less than 1,000 metres we call it ‘fog’ and if visibility is greater than 1,000 metres we call it ‘mist’. This is most definitely a fog. 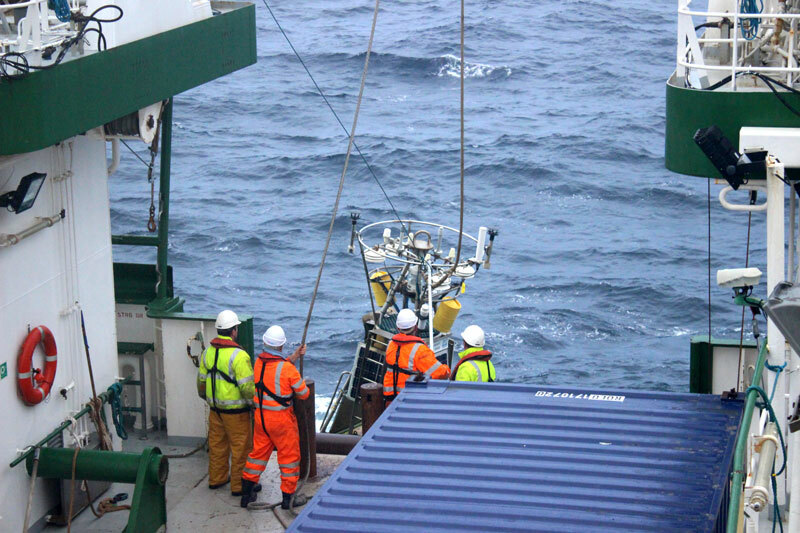 Of course, the weather didn’t stop us from deploying Sebastian (seismometer 17). Named after the crab in The Little Mermaid, who sings ‘Everything is better down where it’s wetter’. This was name suggested twice by two different schools; Gaelcholaiste Carrigaline, Carrigaline, Co. Cork, and also by St Joseph’s College, Lucan, Co Dublin. We’re now expecting to reach our 18th and final seismometer deployment location some time around 7 am tomorrow morning. After that, we will be heading back toward Galway but on the way, we will have one more job to complete. Around Ireland there are a network of weather buoys and one of them, M6, has broken its mooring and is now adrift. Our job will be to retrieve it and bring it back into port onboard the Celtic Explorer. Over the last two weeks, three essential ingredients for successful science at sea have become clear to me. For sure, one is a science team that is highly prepared for their mission. 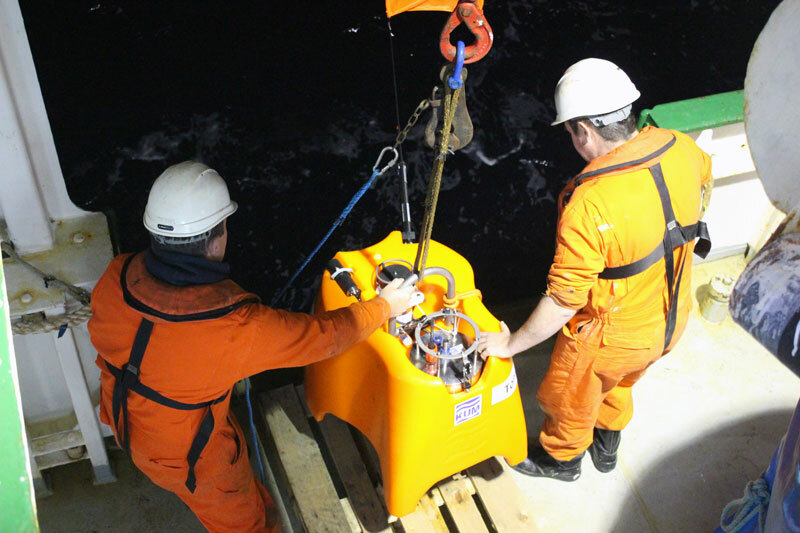 Another is a well-equipped vessel that can facilitate the science team. And third, a ship’s crew that can effectively manage both of these. 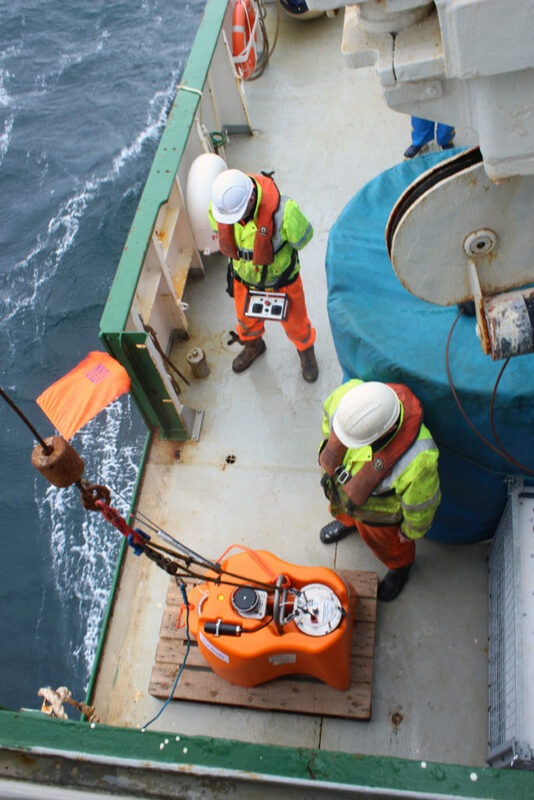 On paper the sea-going mission for the science team is pretty straightforward; carefully assemble seismometer, carefully deploy seismometer, onto next location and repeat seventeen times. In reality, it has pretty much worked out like that, seamless as if done from land. 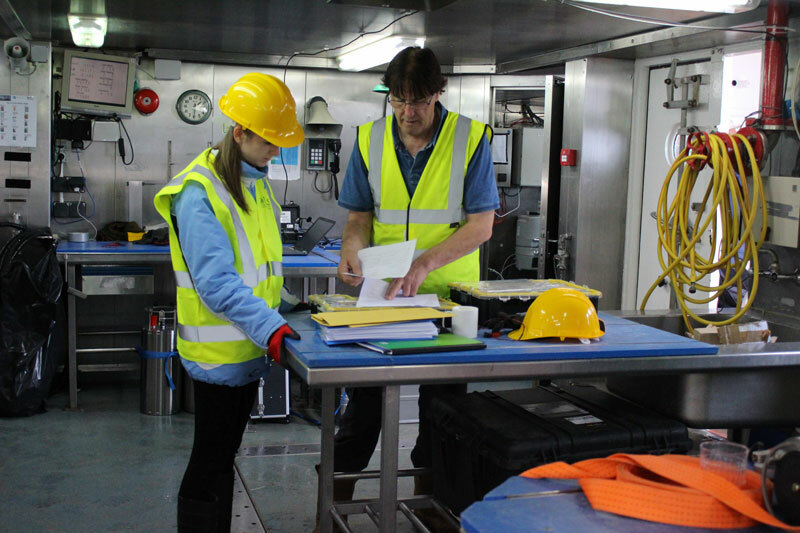 And when the working conditions on a ship in the middle of the wild Atlantic are as conducive to your efforts as if you were in a lab on terra firma, you know something is going very right. This is a testament to the work of the Celtic Explorer and its highly skilled crew. They have provided a platform where the scientists can completely focus on their work. 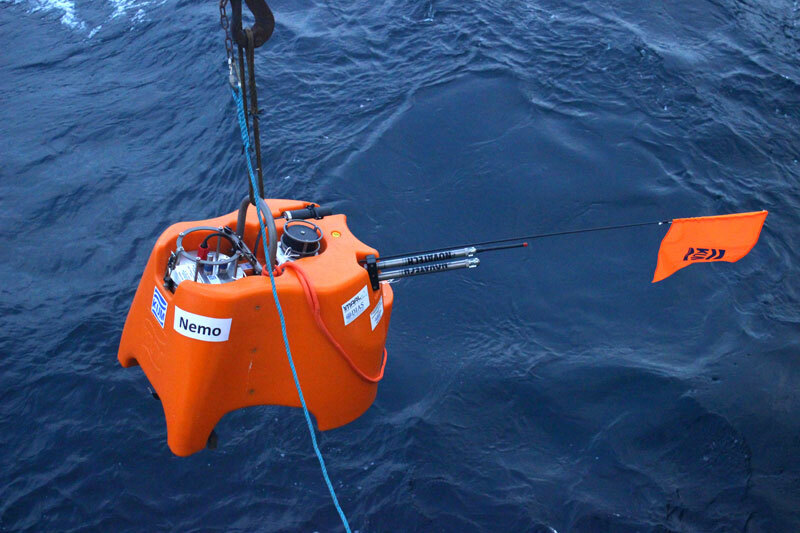 Deploying Nemo Named after the character in Finding Nemo and Jules Verne’s Captain Nemo. Proposed by Aisling Cunningham of Largy College, Clones, Co Monaghan. For the crew, their mission is a lot more complex. Actually, that’s a ridiculous understatement. 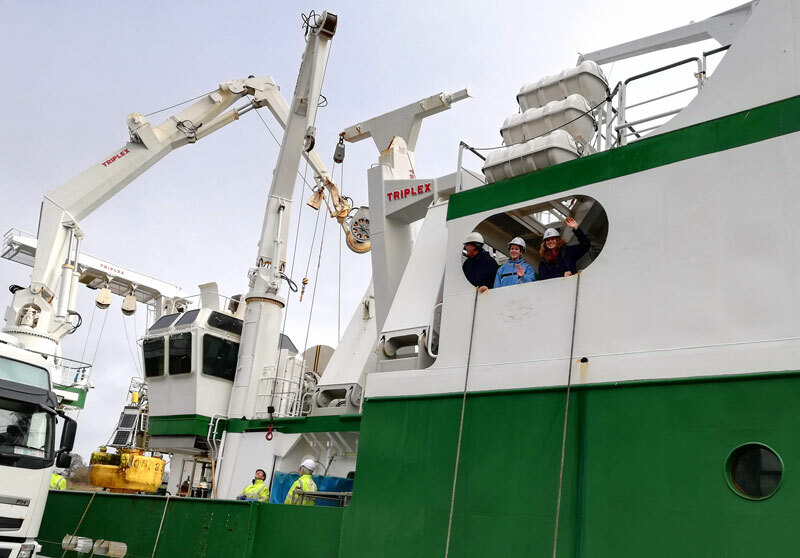 They have a big ship to run and they are bringing a bunch of people, for most of whom it’s their first time at sea, across 1000’s of kilometres of Ireland’s vast territorial water at a time of the year the North Atlantic likes to get violent. They have offered advice and guidance, provided technical and communications assistance and helped us out whenever requested. They are using heavy machinery on a moving and exposed deck to help deploy the seismometers. They have kept the scientists fed and watered with three square meals a day and desserts that have been exceptional, seriously, just ask Clara. 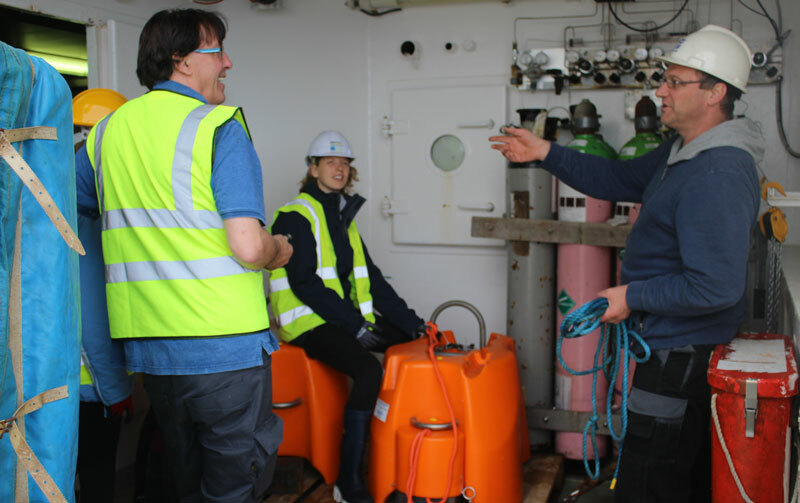 Ultimately, the crew of the Celtic Explorer have worked hard every minute we’ve been at sea, bringing a wealth of seafaring experience to bear, allowing the scientists to do what scientists do, to make the SEA-SEIS mission go as smoothly as it possibly can. When it comes to the ingredients of successful science at sea, this has been essential. We traveled so far west, we passed beyond the range of our telecommunications satellite and consequently we were a ship without internet for two days. It wasn’t the end of the world but it did reveal that all of us are in continual conversation with others elsewhere on the planet. 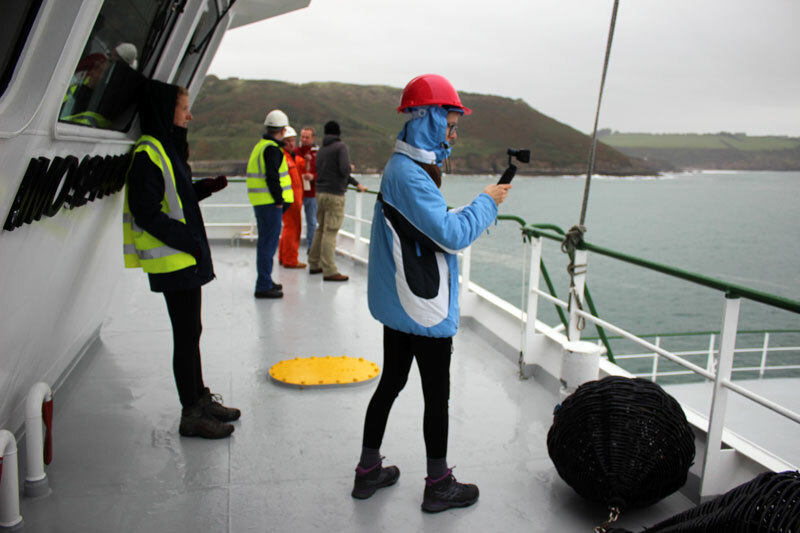 What’s more, rough weather and high waves meant the best course of action was to hold our position in the no wifi zone and wait until the worst of it had passed. It took two days. 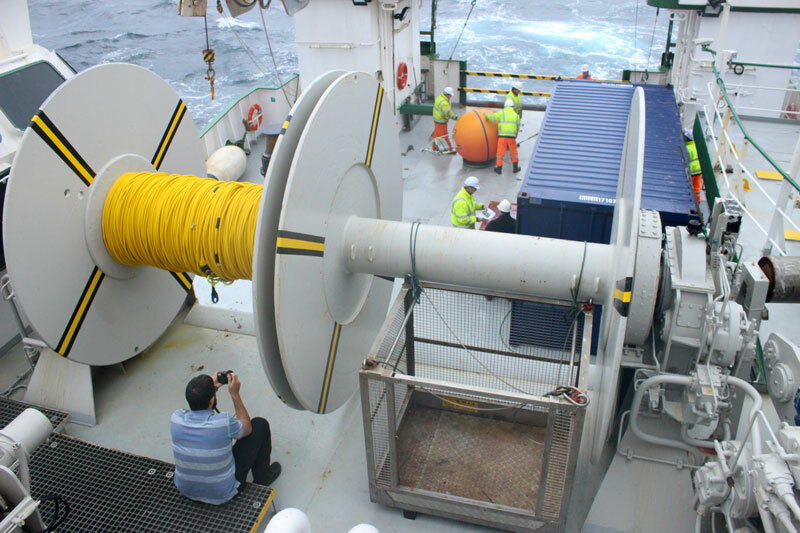 So what happened when we internetless and stationary in the middle of the Atlantic? 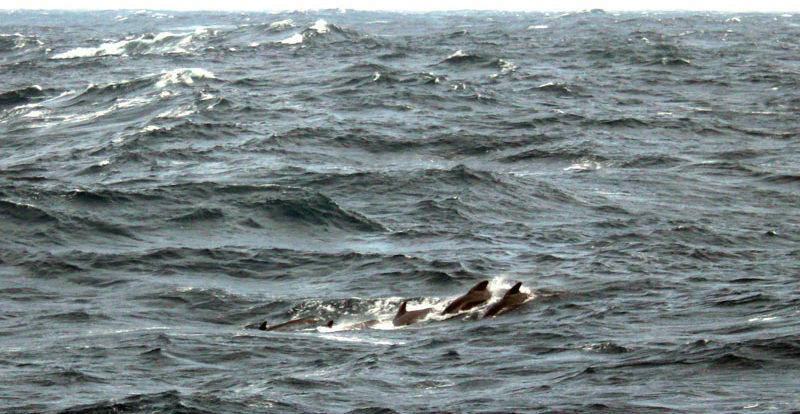 A pod of pilot whales came to visit. 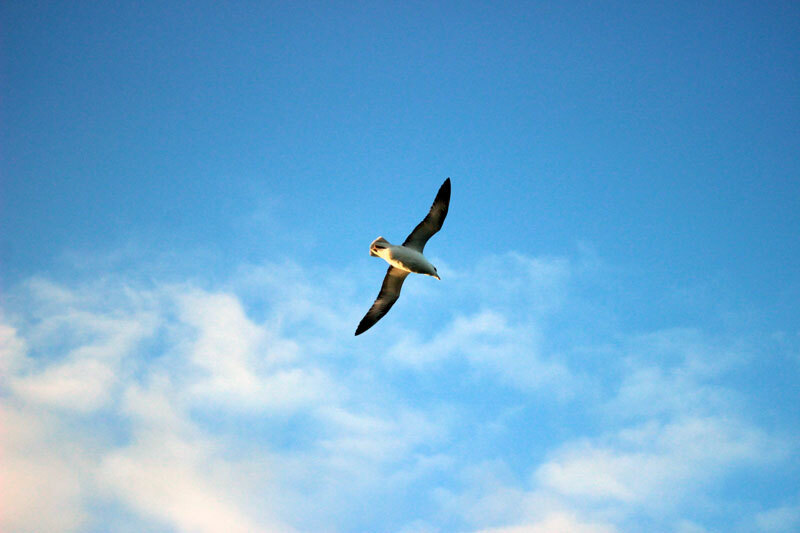 We could see maybe 10 – 15 of them as they briefly surfaced close to the boat. They’re a little bigger and darker than dolphins. 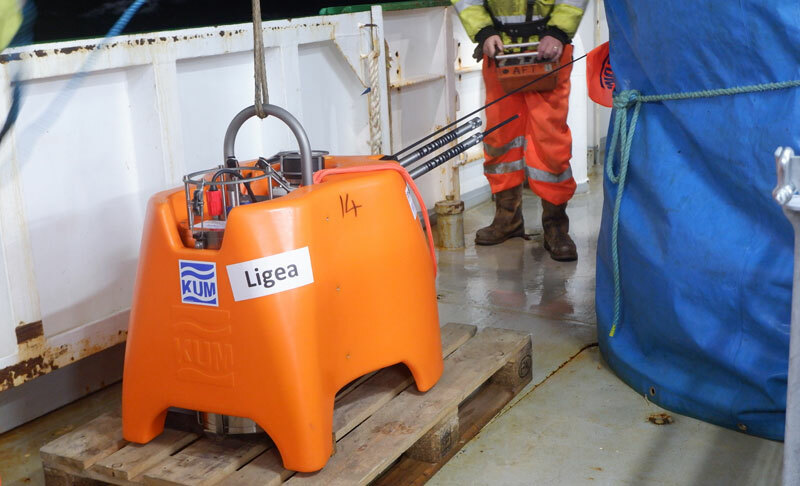 We deployed Ligea (seismometer 14) at 5am on the 28th. Named for a mermaid from Greek mythology who landed in Terina, an archeological site in Calabria, south Italy. It was the winning suggestion by Classi 5a e 5b at the Istituto comprensivo don Lorenzo Milani, Lamezia Terme, Calabria, Italy. 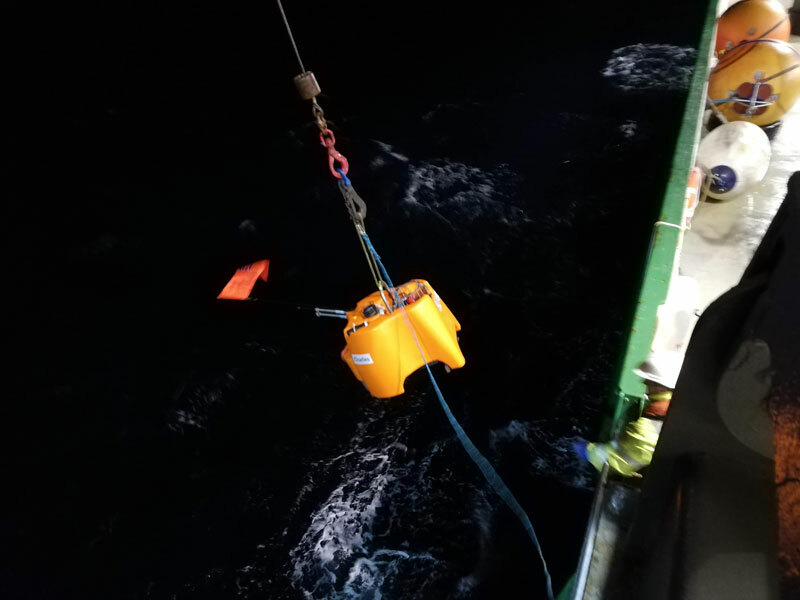 After we got moving again, we deployed Wilson (seismometer 15) at 9pm. There’s multiple inspirations for this name, the ball from ‘Castaway,’ Brian Wilson of the “Good Vibrations” fame, and Tuzo Wilson, a geophysicist who made important contributions to the theory of plate tectonics. This was suggested by two schools: Kingswood Community College, Dublin 24 and Presentation College Bray, Co Wicklow. 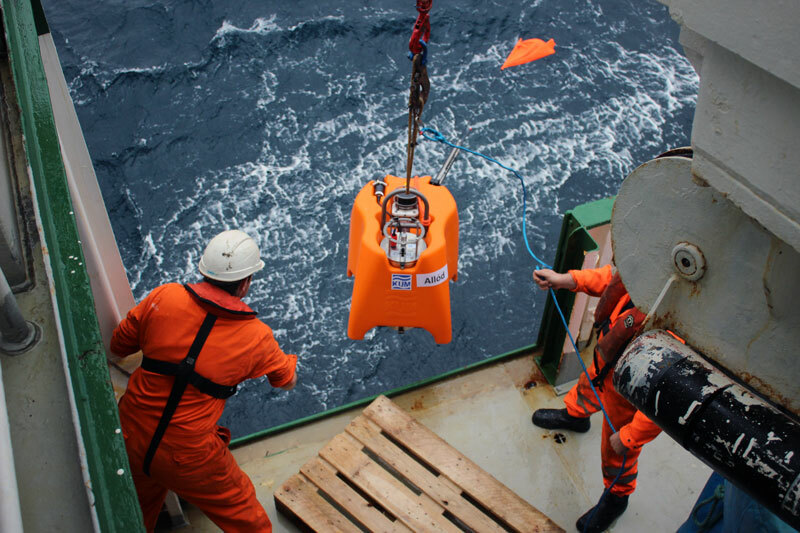 We’re now on the home straight, three final seismometers to be deployed along on the way. This is the furthest point from Ireland we will be on this voyage. A 1000 kilometres out into the North Atlantic. 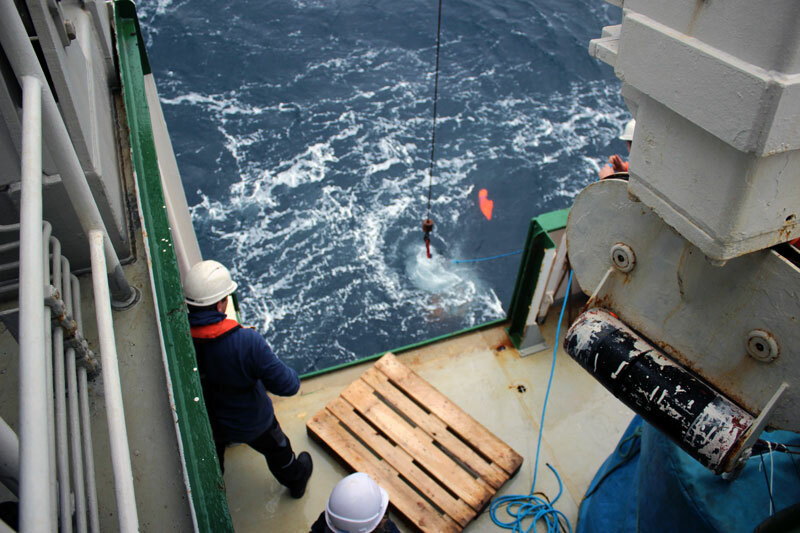 Some distance, although on one of the first seismometer deployments, when we were sat on top of 4,ooo metres of water and a churning sea all around, this lesser distance was the more difficult to fathom. 13 seismometers deployed, 5 more to go. We have a team meeting every evening after dinner at 7 pm, and at some point in the meeting, we look at the weather forecast. On the particular website we visit, the forecast plays like a movie on a map of the Atlantic, storms shift, waves heights vary and its all very colourful, mesmerising in fact. Thing is, it hasn’t been all that accurate. There’s been bad weather forecast in a few days since the start but it just hasn’t materialised. But for sure, we’re not complaining, in truth we count ourselves incredibly lucky with how things have worked out so far, the weather has been kind and we’re ahead of schedule, can’t really ask for more. 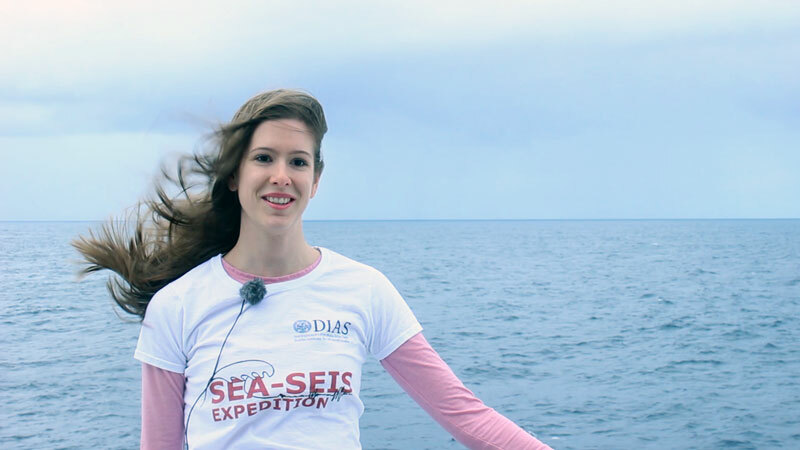 Laura Bérdi is a PhD student in Geology at the Dublin Institute for Advanced Studies. 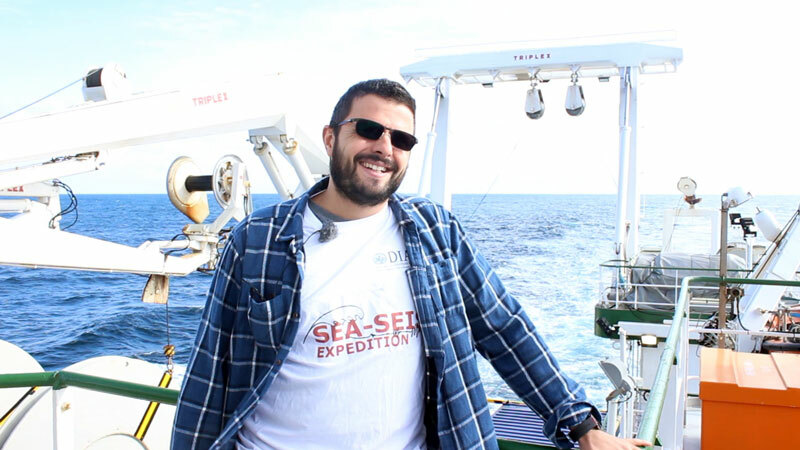 Raffaele Bonadio is a PhD student in Seismology at the Dublin Institute for Advanced Studies. 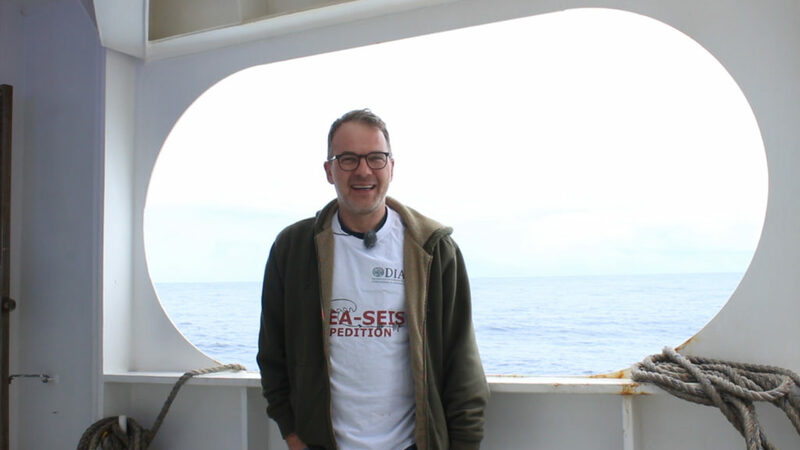 I’m Daniel Farrell, I work in digital media and am onboard to document the voyage, one part of which is this blog. 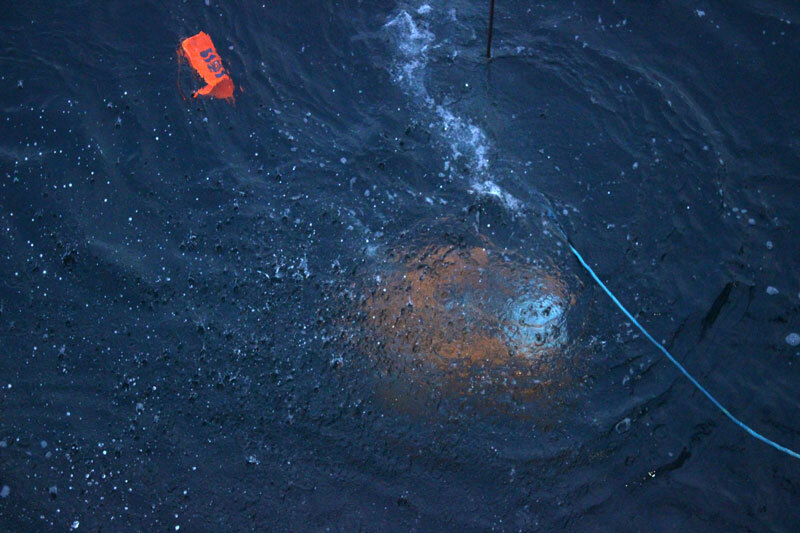 At 7 pm, we deployed Namor (seismometer no. 12). The name was submitted by Glenstal Abbey School, Murroe, Co Limerick. Just in case you are somehow unfamiliar with the name, Namor the Submariner is a Marvel superhero. The mutant son of a human sea captain and a princess of the mythical undersea kingdom of Atlantis, Namor possesses the super-strength and aquatic abilities of the Homo mermanus race, as well as the mutant ability of flight, along with other superhuman powers. So now you know. Today has been a calm weather day, after what was a fairly rough night, not much sleep had by anyone. The ship had to slow to a crawl so a 12 journey turned into an 18 hour one. Coláiste Phobail Cholmcille, Tory Island, Donegal. We’ve started video links with schools. It’s gone well with every class so far asking lots of questions about our mission and life at sea. This photo was sent to us following our chat with Coláiste Phobail Cholmcille on Tory Island, Donegal. Thanks Máire Clár Nic Mhathúna! Whales were spotted today and while they were fairly far away we have it on good authority that they were fin whales, identified by the particular spray signature made when they surface. Now it was certainly great to be able to recognize these fantastic beasts from afar but a close-up encounter is still very much hoped for. Also, word is there are lots of orcas round these parts. 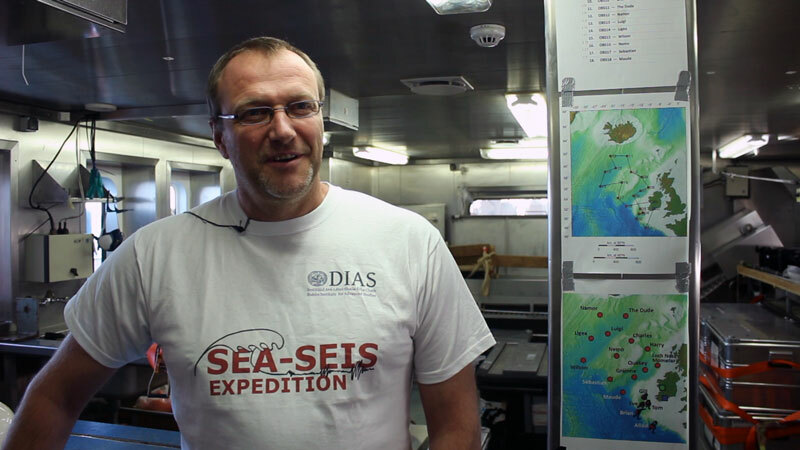 Three more members of the SEA-SEIS team to introduce you to today. 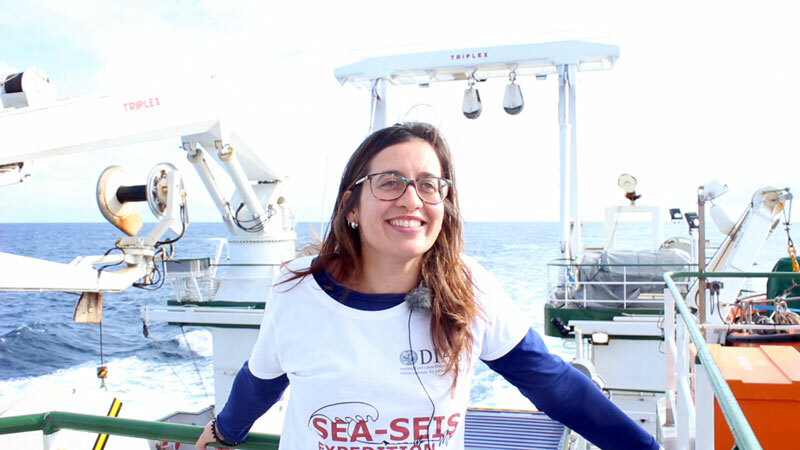 Clara Gómez Garcia is a PhD student in Geophysics at the Dublin Institute for Advanced Studies. 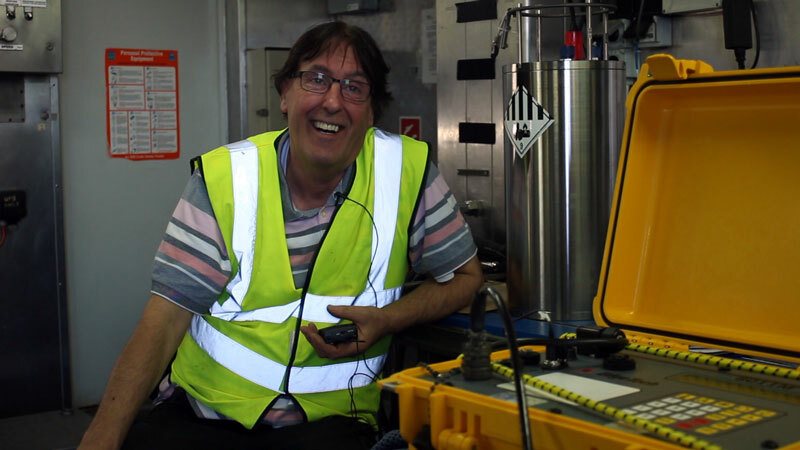 Mick Smyth is the Technical Officer with the Dublin Institute for Advanced Studies. 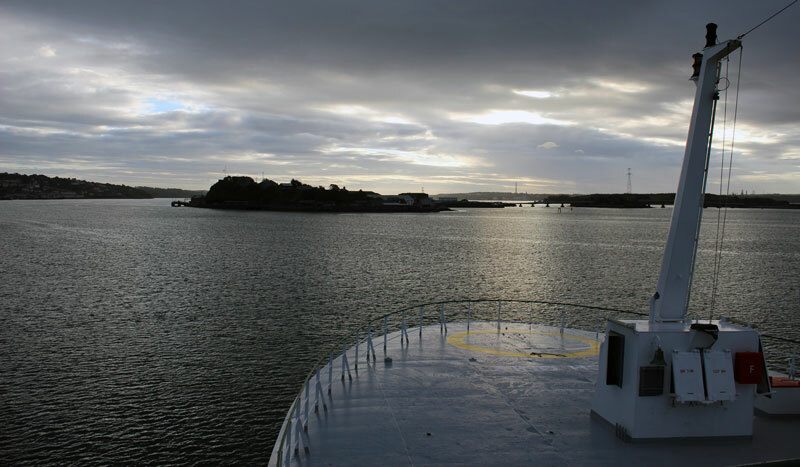 David Stalling is a sound artist and joined the voyage to develop new work based on his experiences of spending time onboard the RV Celtic Explorer as part of the Aerial/Sparks project. 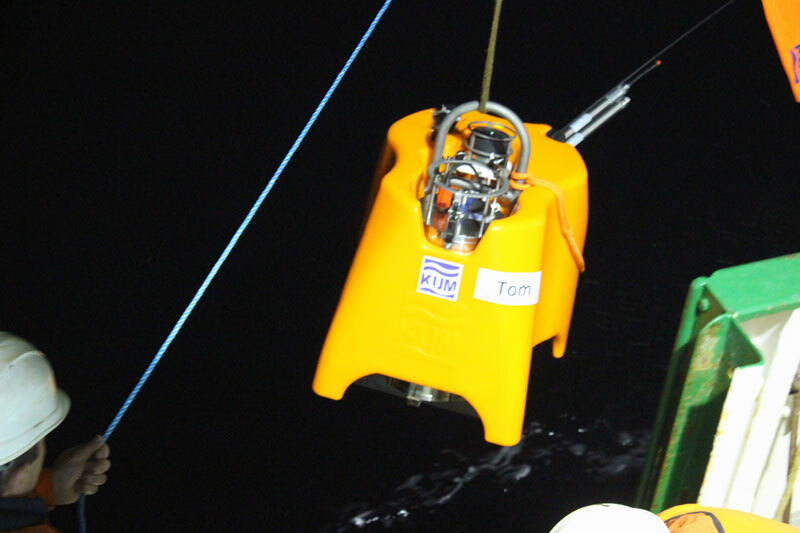 We deployed Charles (seismometer no.10) last night at 10pm. Named after Charles Richter, the creator of the Richter magnitude scale that quantifies the size of earthquakes, and Charles Darwin, the naturalist and marine biologist. It was submitted by the 1st year Science class at St Muredachs College, Ballina, Co.Mayo. We deployed The Dude (seismometer no.11) at 3 pm. The name was submitted by Dunamase College, Portlaoise, Co. Laois. Even 2,000 metres underwater, the Dude abides. We’re very close to Iceland now and you can feel it in the cooler air. 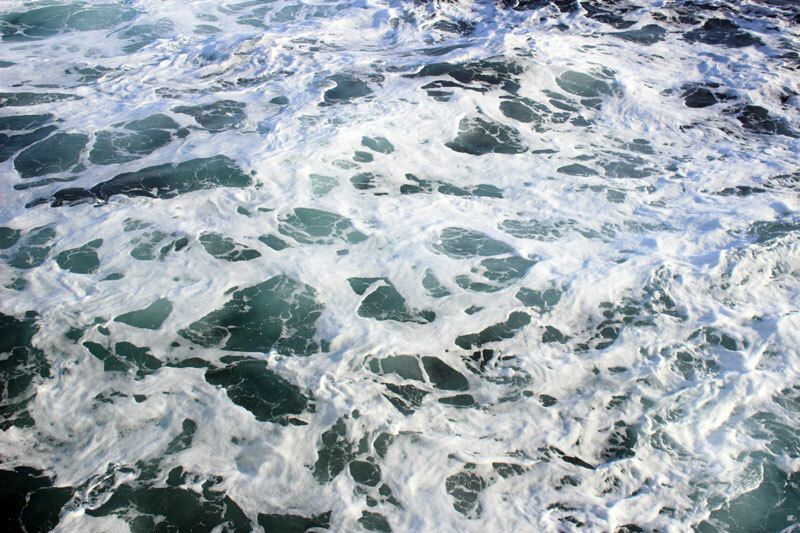 The waves are pretty big, they come in long swells which are smoother to sail, the sea is slate grey, so is the sky. Having seen more than our fair share of dolphins, everyone’s keen to see whales but the chances of spotting any marine life under these conditions are very low. 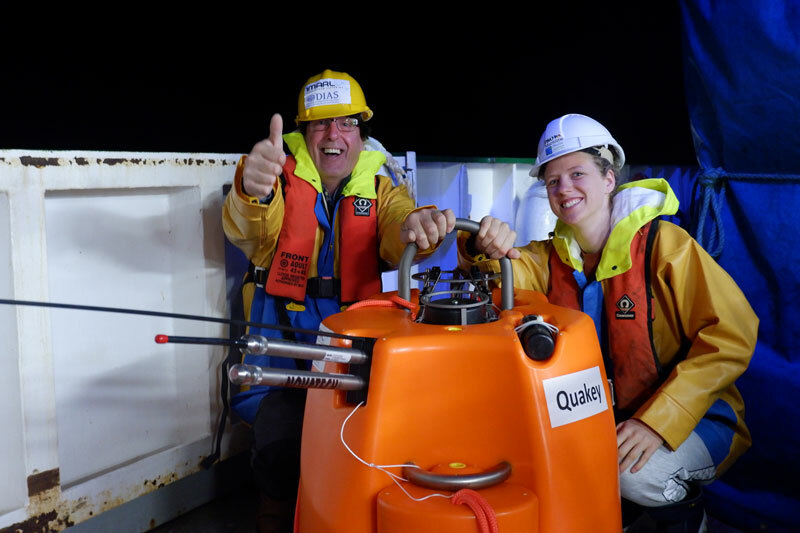 Seven days in now’s a good time to introduce the team conducting the science at sea. 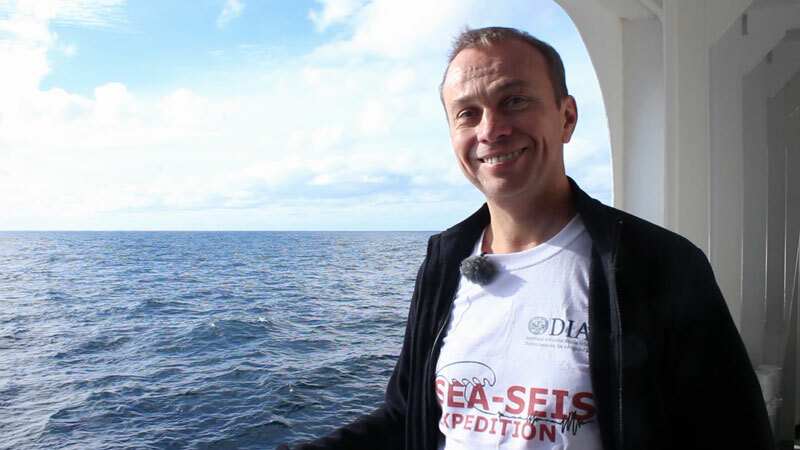 Meet Sergei Lebedev, he’s the principal scientific investigator on the SEA-SEIS team and assistant professor of seismology at the Dublin Institute of Advanced Studies. 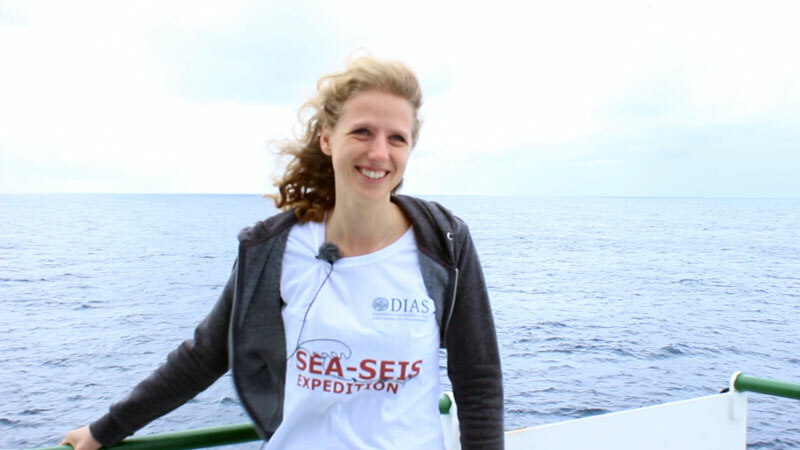 Janneke de Laat is a PhD student at the Dublin Institute for Advanced Studies. 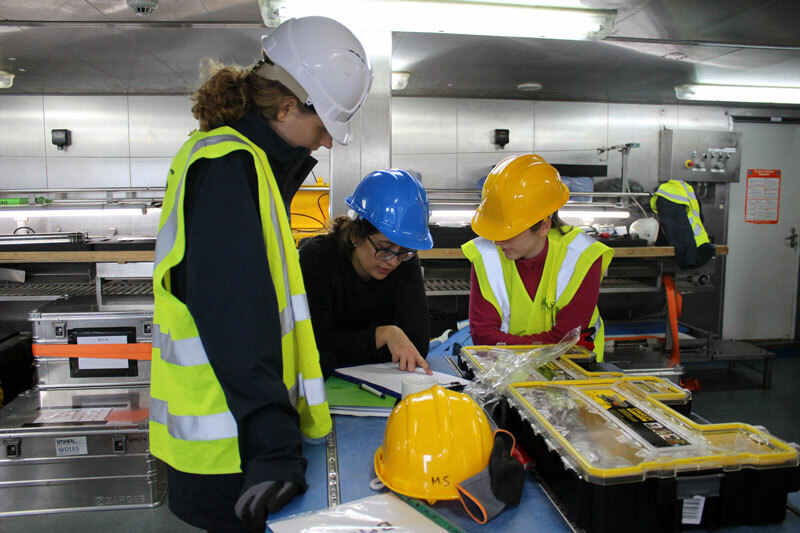 She will be the first person to use the data that the seismometers collect over the next 18 months. 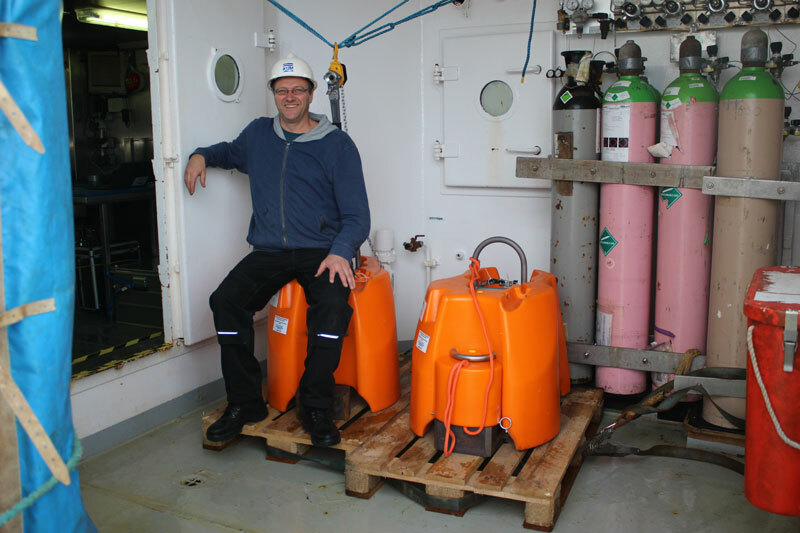 Arne Schwenk is a physicist and the inventor of the device (see image below) we are using to deploying the ocean-bottom seismometers. 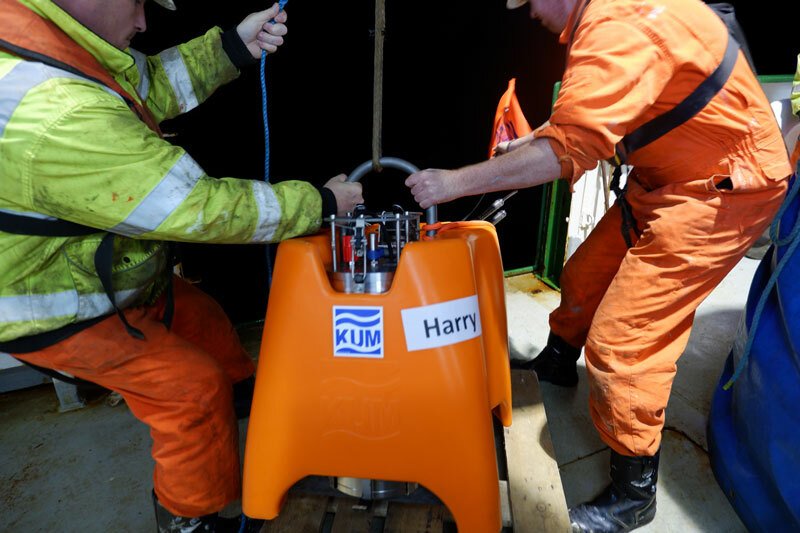 We deployed Harry (seismometer no.9) at 7 am this morning. The name comes from ‘Harry H Hess’ who discovered seafloor spreading (plate tectonics) and was suggested by the 6th year geography class at Gorey Community School, Gorey, Co. Wexford. 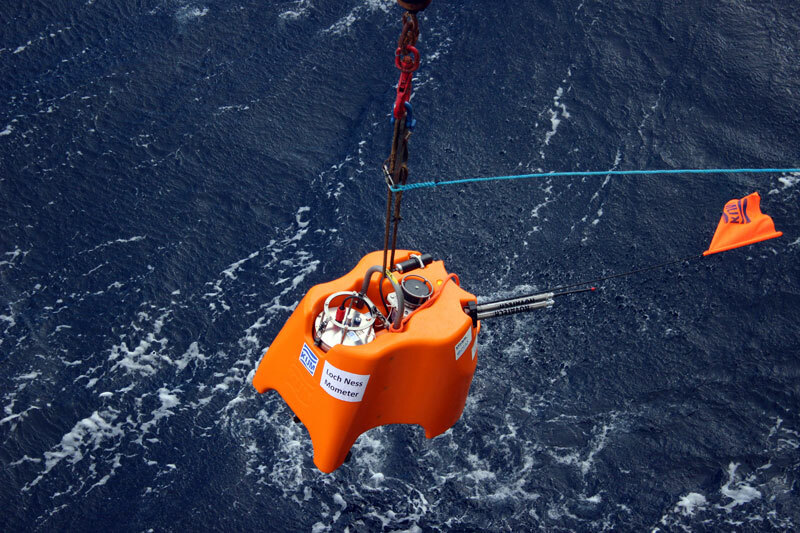 We’ve now deployed half of the eighteen seismometers to the bottom of the sea where they will sit collecting data for the next 18 months. 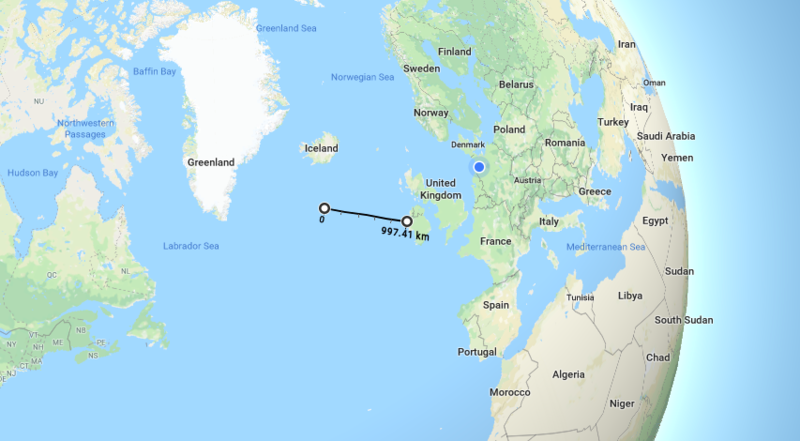 Now heading northwest from Ireland, toward Iceland and the more remote locations for seismometer deployment. The weather reports are indicating things might get a bit rough over the next day or two with strong winds and 5 – 6 metre waves. Should be grand! Three more into the deep sea today. Gráinne (Seismometer no. 6) was deployed at 10 pm. Named after Gráinne Ni Mhaille, the “Pirate Queen” who was lord of the Ó Máille dynasty in the west of Ireland. This name was the winning entry by Our Lady of Mercy Secondary School, Waterford. Quakey (seismometer no. 7) was deployed at 4 am. This seismometer name was the winning entry by Pobalscoil Iosolde, Palmerstown, Dublin 20. Loch Ness Mometer (seismometer no. 8) was deployed at 1 pm. This clever name was proposed by second year student Marie Barr from Scoil Mhuire, Buncrana, Co. Donegal with geography teacher Denise Dowds. Two more deployments make it four in twenty-four hours. At 10 pm, Tom was winched overboard into the foamy black. Named after legendary Irish explorer Tom Crean, the competition-winning name was submitted by Eimear Courney and the Transition Year Biology classwith Teacher Colette Smith at Largy College, Clones, Co Monaghan. 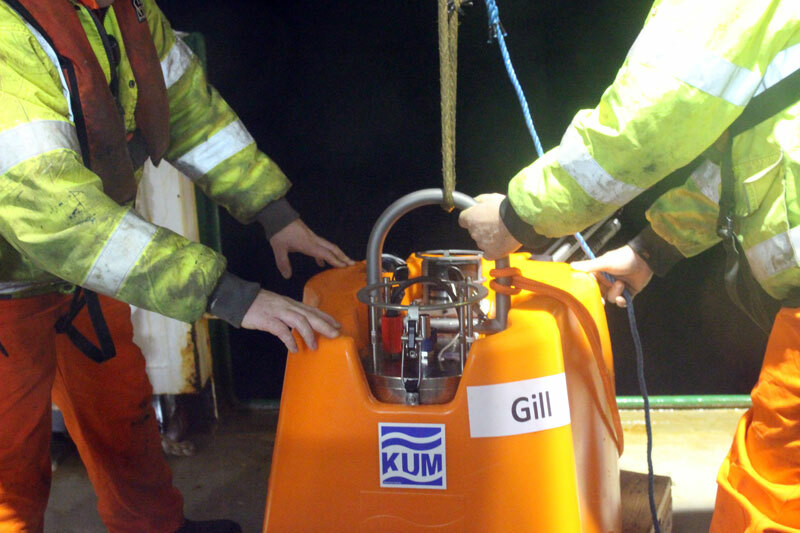 At 5 am the following morning, Gill was deployed. Named after that most important organ that helps fish breathe, the name was the winning submission from Grange Community College, Donaghmede, Co. Dublin. and their science teacher Mr Nolan. We’re traveling north at about 12 knots. 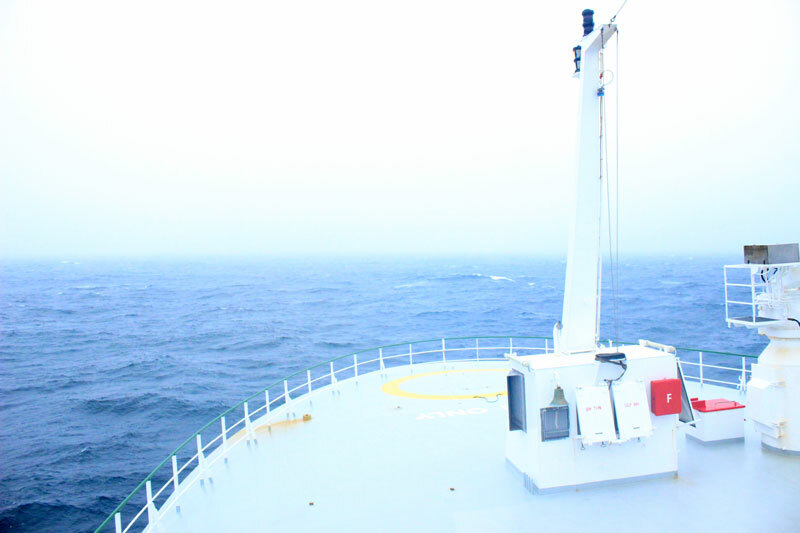 The weather has been calm the last few days, waves are much smaller, the journey smoother. Simple activities like walking, working, sleeping become much easier when wave height is below 2 metres. Long may it last! The seismometer deployments are coming thick and fast now. 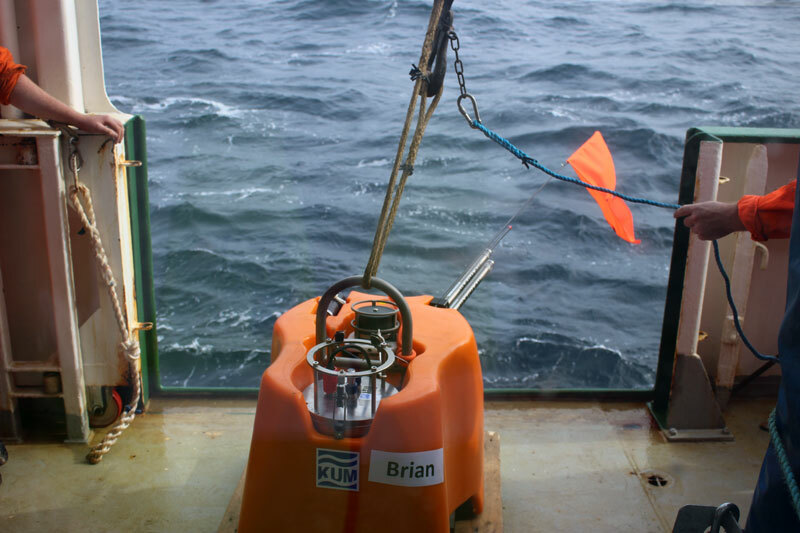 First up this morning was seismometer 2, or “Brian”, after Brian Jacob, who led the work on the continental nature of the basins west of Ireland, leading to Irish territory increasing by a factor of 10. He also happened to be the Senior Professor of the Geophysics Section, at the Dublin Institute of Advanced Studies from 1989 until 2001. 5pm this afternoon, we deployed seismometer no.3 or “Eve”. 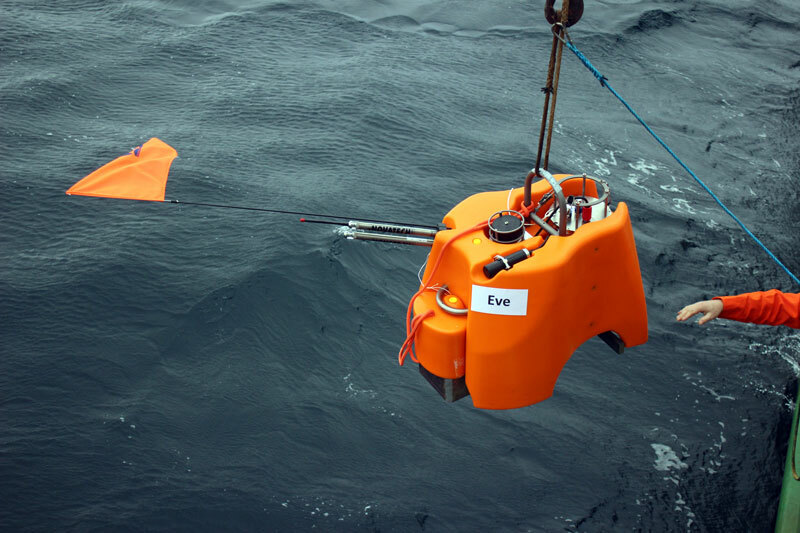 The name is a clever wordplay winner in the seismometer-naming competition derived from ‘eavesdropping on the Earth’ and was submitted by the 5th Year Chemistry class at St. Patrick’s College, Gardiner’s Hill, Cork City, Co Cork, and their teacher Erin Keogh. So that’s three of the eighteen seismometers now deployed. You can see in the map above all of the scheduled deployment sites over the next three weeks. 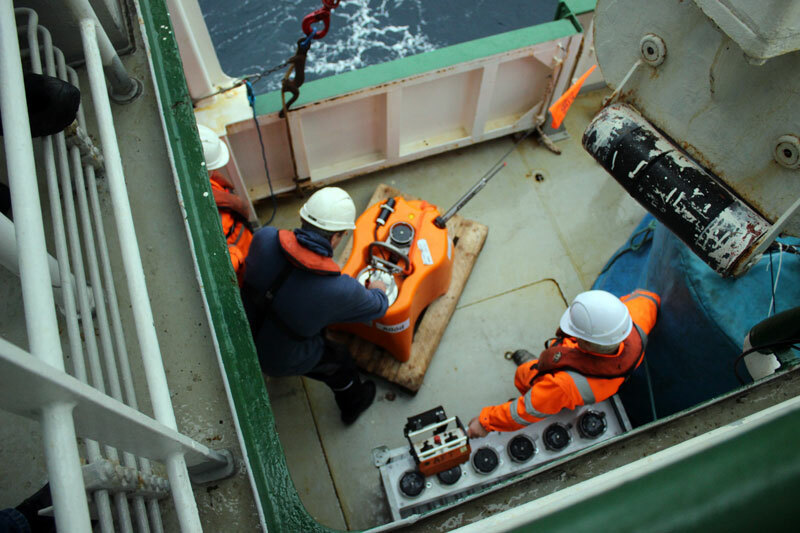 The three seismometers deployed so far – Allód, Brian and Eve – are the most southerly locations and there’s a vast area still to be covered. 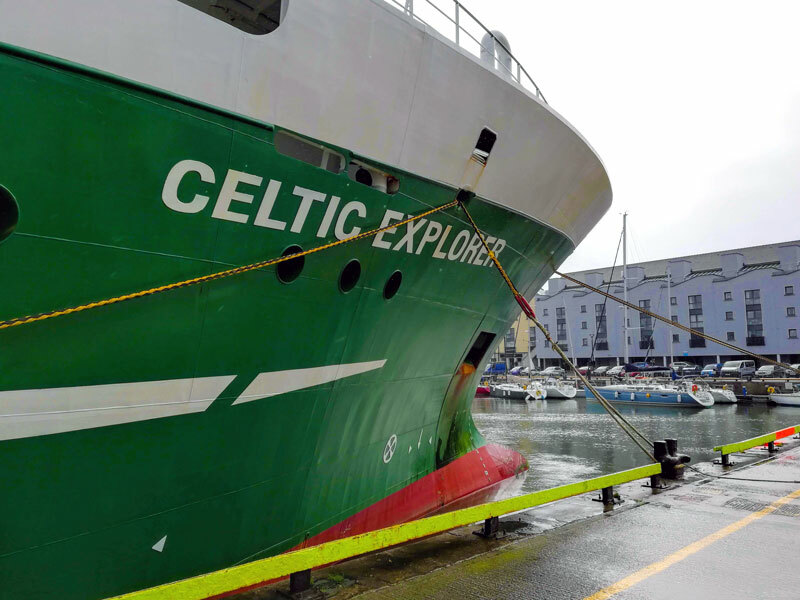 *Interesting factoid – The Celtic Explorer produces around 8 tons of fresh water every day for use on board. 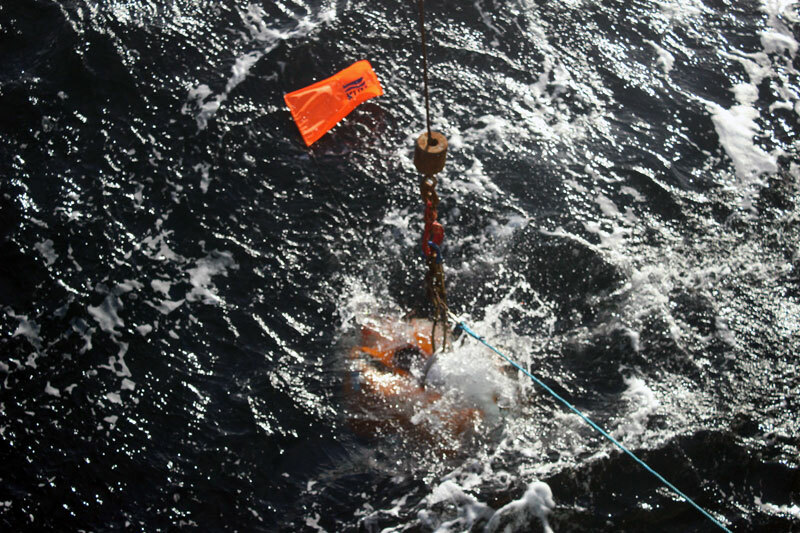 9 am – All the testing compete, at the first location, 4000 metres of water below. Time to deploy the first seismometer. 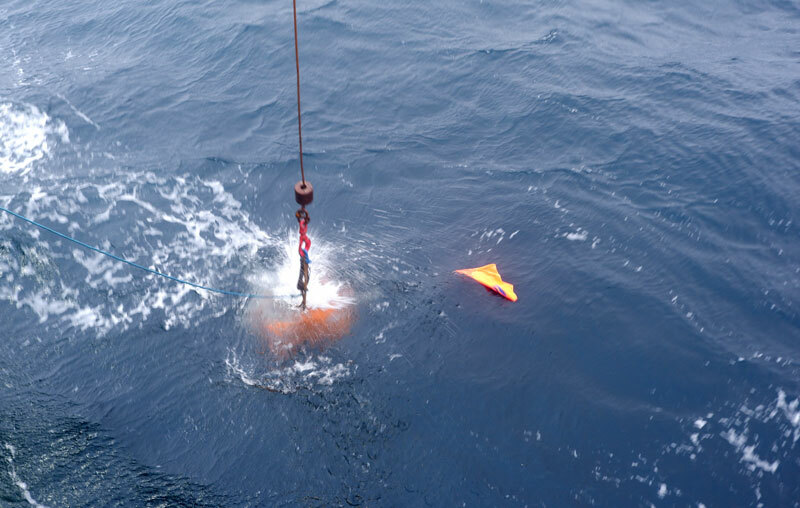 The seismometer has been christened “Allód” which is an ancient name for the Irish God of the sea. The name was the winning entry in the seismometer naming competition and it was suggested by Coláiste Phobail Cholmcille, Oileán Thorai, Contae Dhún na nGall (Tory Island, Co. Donegal). Congratulations to the whole class and their teacher Máire Clár Nic Mhathúna! As for the deployment, the great news is it went as smoothly as we could have hoped. 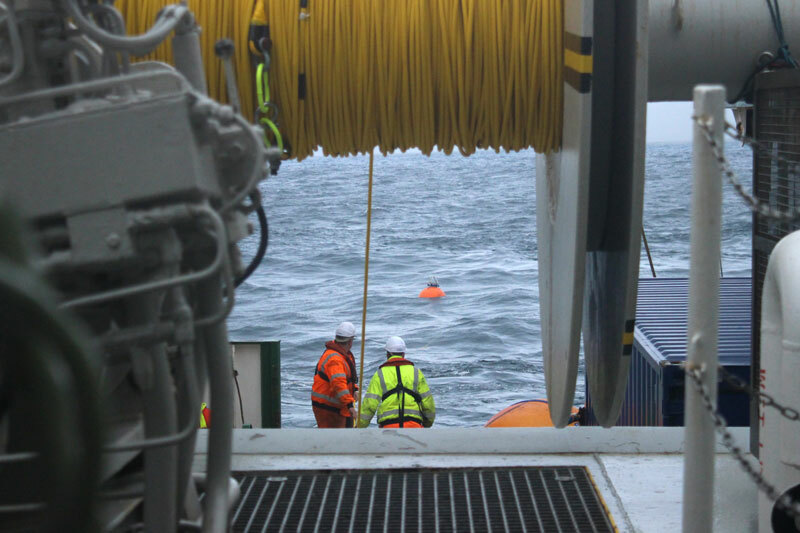 Allód is winched off the starboard side by the Celtic Explorer crew and released into the water. 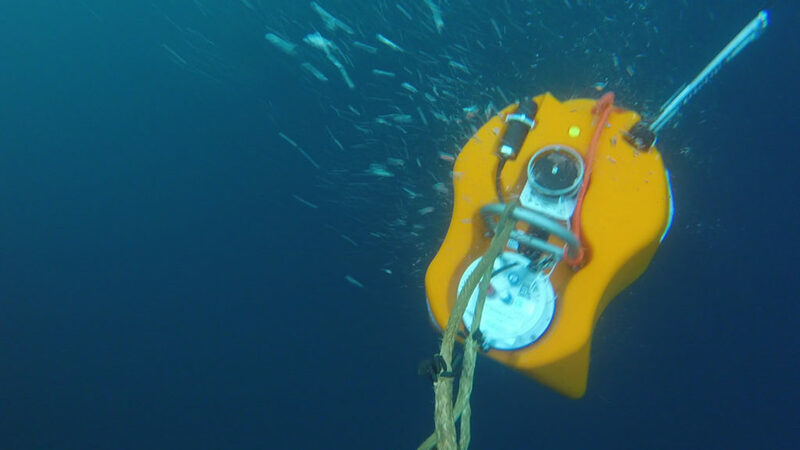 It will now sink 4km to the sea floor, come to rest and collect data from deep within the earth for the next 18 months. Then there will be a retrieval mission but that’s a story for another day. Just a little note about the weather – there’s been some big waves and over a certain height, about 4 metres I believe, it becomes unsafe to work. 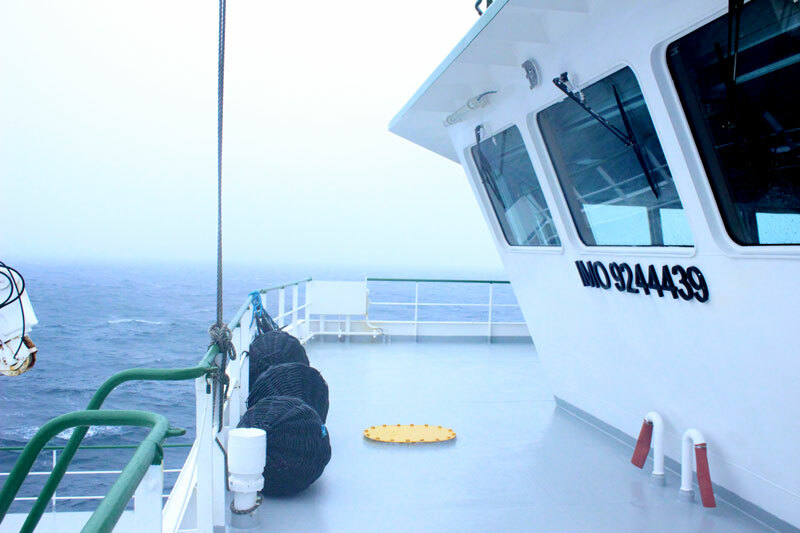 Today, the conditions were fine but given it’s the time of year where storms become a common feature in the North Atlantic, there’s been some talk between the scientists about altering the order of locations we visit in order to arrive at the best time. Essentially we want to be at our locations when a storm isn’t. Of course, weather forecasts being fickle things, these are tricky conversations and involve a lot of weighing up of options and alternatives. 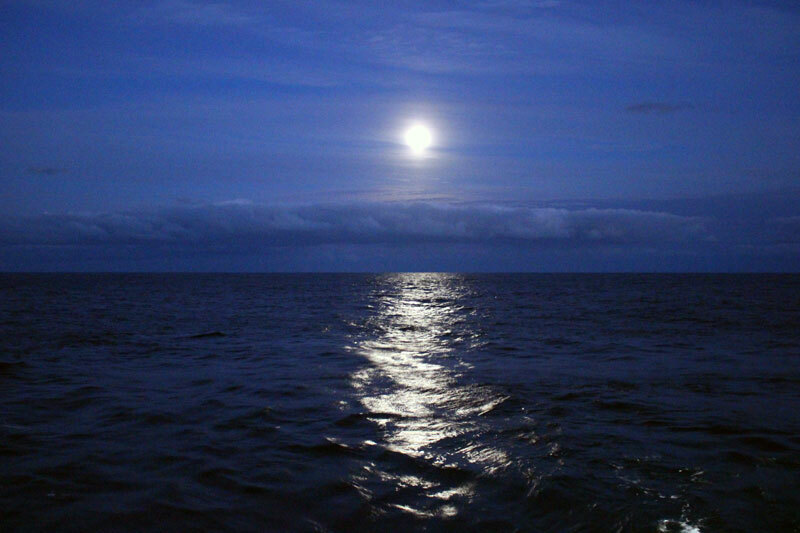 Now, onto our next location, traveling at 8.5 knots, it’s about 12 hours away. 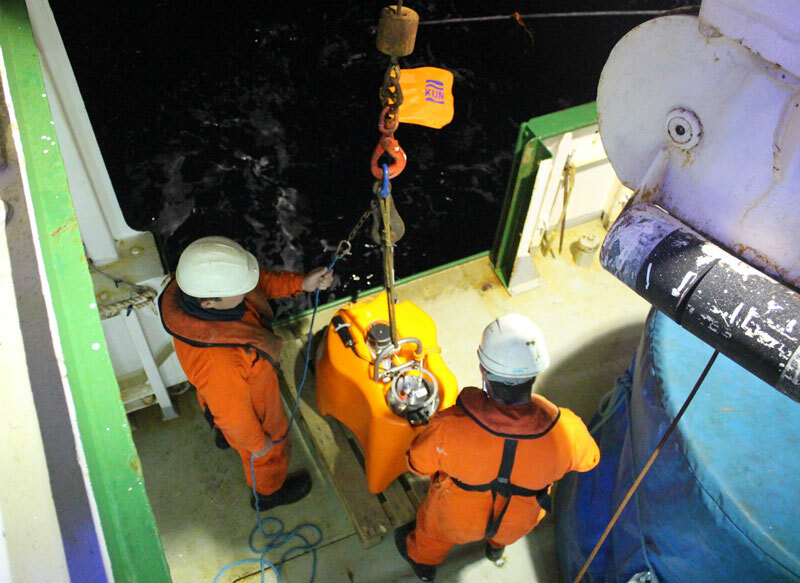 We’re expecting to reach the first seismometer deployment location around midnight. We’ve traveled so far south that we’re not really experiencing the heavy winds that Storm Ali has brought back home, waves are still quite big but it shouldn’t affect the deployment process. Now the team is preparing the equipment for our arrival at the first deployment site and giving everything one last check. All the preparation done, now we wait for show time! Day 1 – We’re on our way! 7 am breakfast, then 8 am came around really quickly and we were off. We gathered up on deck to watch as the Celtic Explorer made its way out to sea. First past Cobh, looking great as always. 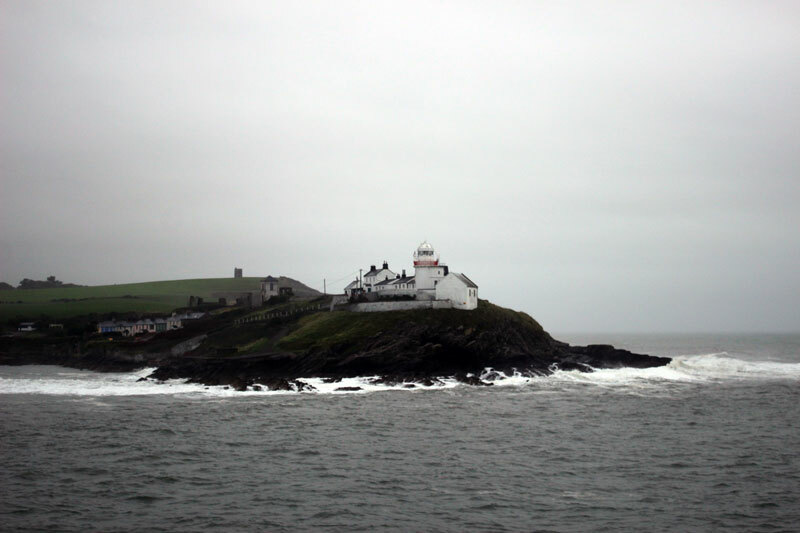 Last past Roche’s Point Lighthouse at the entrance to Cork Harbour. So, finally out at sea, I had lots of photos to process, emails to send, various other bits and bobs to do on my computer. It was about half an hour later the seasickness kicked in. I’ll omit the gory details, suffice to say there’s definitely a certain amount of adjusting the human body has to do to life on a boat on 5 metre waves. We’re now making our way along the southwest coast to the first seismometer deployment site. We should reach it tomorrow. I’ve arrived at the Celtic Explorer in Cobh and due to the intense weather the southeast is experiencing, the departure has been put back until tomorrow morning 8am. This has allowed me to explore the ship and meet my new shipmates without contending with 6 metre waves rocking the boat. We had an orientation briefing from the crew. They gave us the lowdown on ship. One thing is very clear, should I hear an alarm of any kind I know the muster station is the place to be. The DIAS scientists have had their first team meeting and everyone is now excited for tomorrow, heading out to sea on a pretty unique science mission. The weather is expected to be fairly rough for the next couple of days but that certainly isn’t dampening the enthusiasm of anyone onboard. It’s Sunday, and this time tomorrow, I’ll be aboard the Celtic Explorer as it makes its way out to sea. My bags are packed, train ticket to Cobh and various necessary documents in hand, and I feel ready to go. Here and now is a good time to make a rough list of some of the questions I’d like to answer. What is it the scientists hope to learn from this mission? What is it like to live aboard the Celtic Explorer? 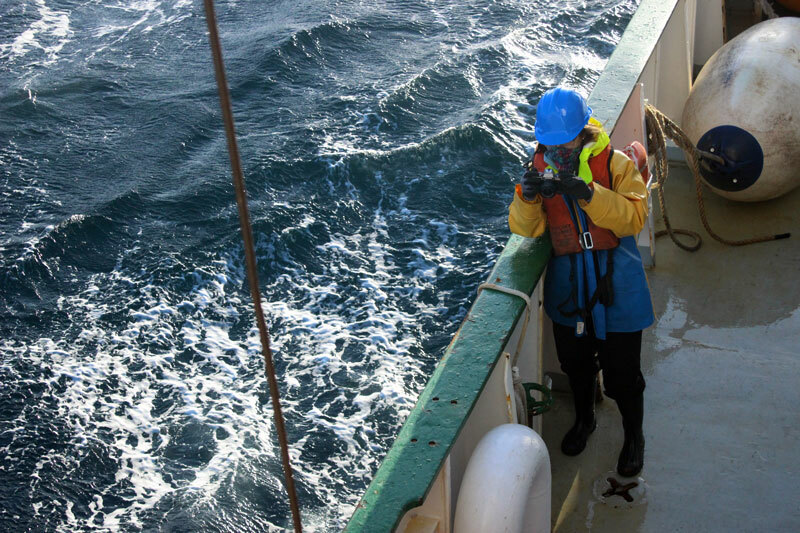 What’s it like to be a scientist at sea? What’s an average day at sea like? I think this is a good starting point and I’m sure many more question will occur to me. Ok, I’ve been putting together my checklist of things I will need and things I think I’ll need. I generally like to travel light (who doesn’t?) but when you going out to sea and the closest supermarket is a bit out of the way, I’m thinking you gotta be thorough. There’s something missing from this list but I won’t remember what it is until Cobh is slowly disappearing over the horizon. I’ll remember very clearly what is then. There’s some essential certification you have to get before going out to sea. 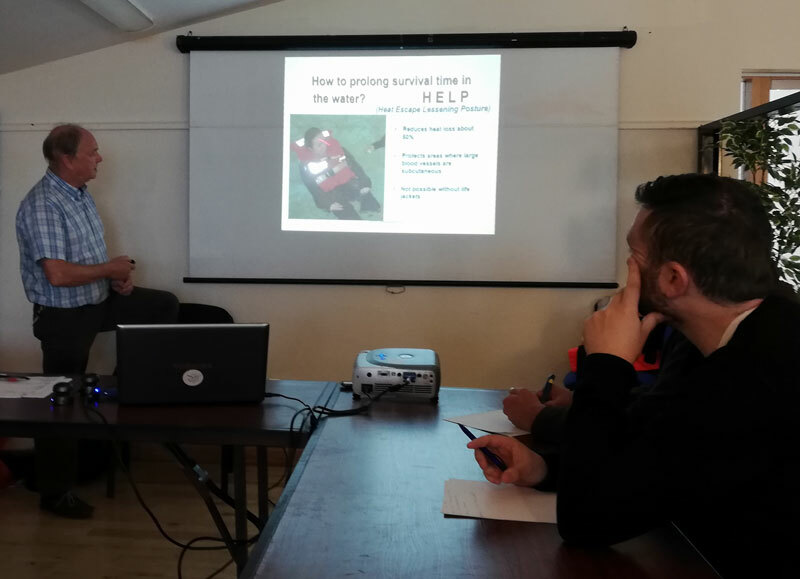 We had a morning class about what to do in an emergency situation. 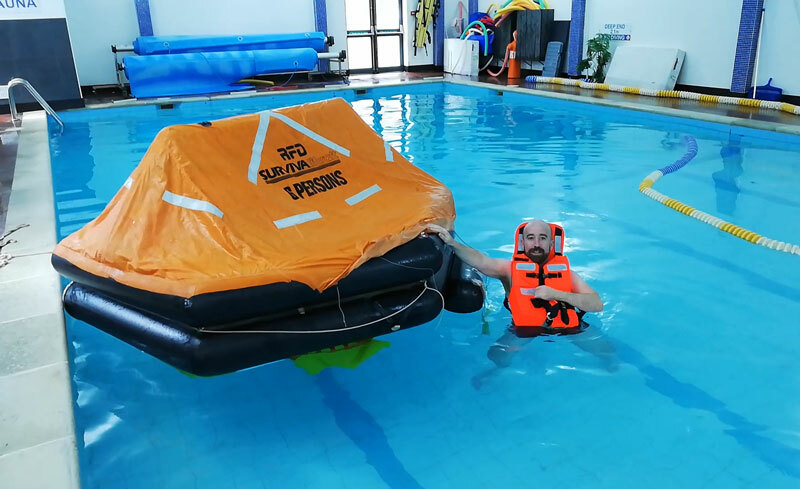 In the afternoon, we had a pool session where we practiced using emergency equipment. I now certainly feel a lot more informed about emergency procedures, emergency equipment, and general safety. I’m also one hundred percent certain I would like a nice, uneventful journey. You also have to go for a Seafarers medical which involved hearing and sight tests and the usual medical checks. Both of these result in documentation that you have to bring with you when boarding the ship. 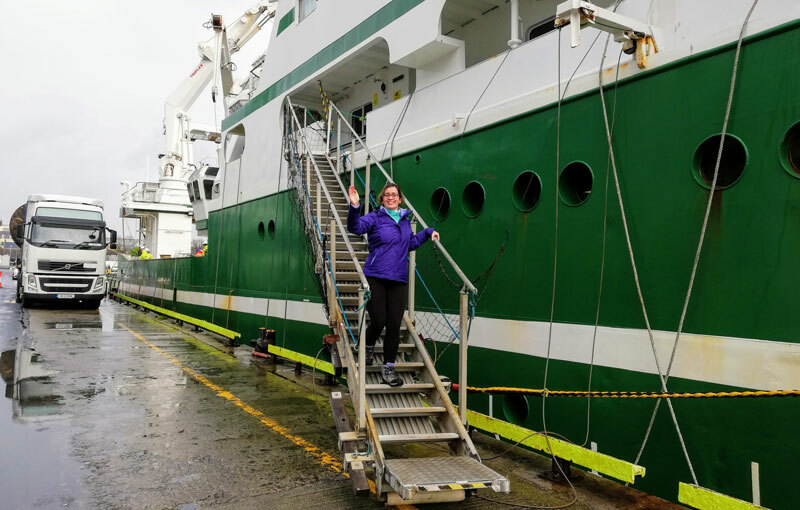 A few weeks ago, out of the blue, I got a phone call and was asked to join a 21-day marine science research mission heading deep out into Ireland’s Atlantic waters. I didn’t have to think long about the offer and quickly said yes, I mean, how often do you get an opportunity like that? Now that I’ve had time to think about it I have lots of questions but bunched together they can be summed up in one: What’s life at sea really like? It’s a question I’d really like to explore and hopefully will by the time this voyage is concluded the answers will be found in this blog. But first here are a few questions I do have the answer to. 1. What’s the research mission you’ve joined? 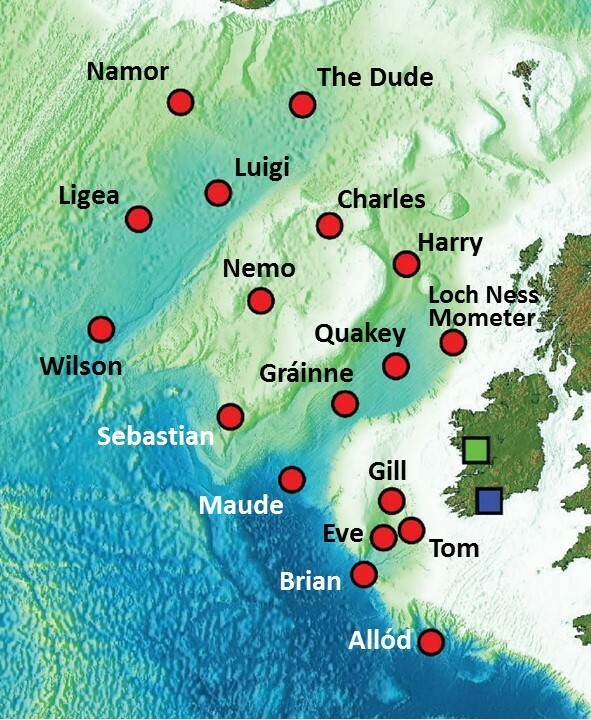 The 21-day deep sea mission is a part of the SEA-SEIS project (Structure, Evolution And Seismicity of the Irish offshore) which is being run by the scientists from the Dublin Institute for Advanced Studies (DIAS) and will involve the deployment of seismometers to the bottom of the North Atlantic Ocean at locations covering the entire Irish offshore area. These devices will be in place for 18 months and will record the vibrations that come from deep within the Earth. 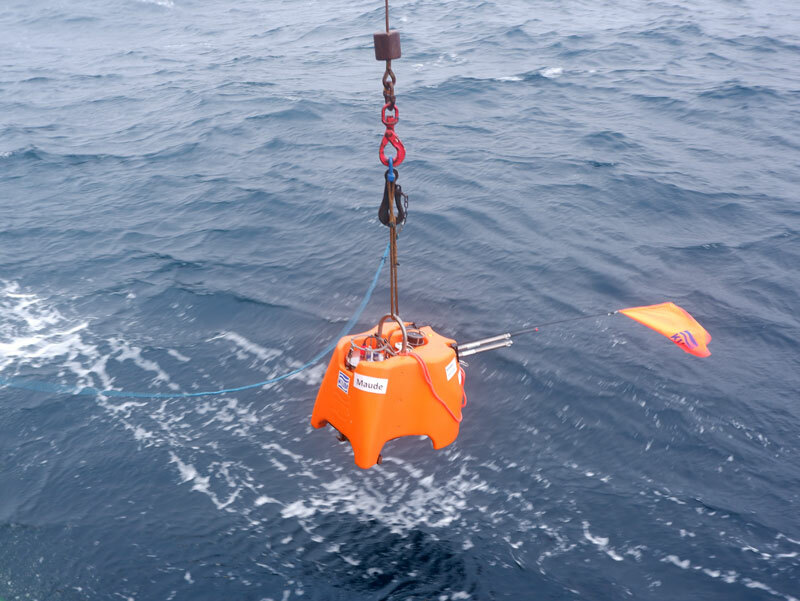 The information the seismometers collect will allow the DIAS scientists to shed light on the nature and history of the deep ocean floor along Ireland’s west coast. 2. When does the voyage begin? 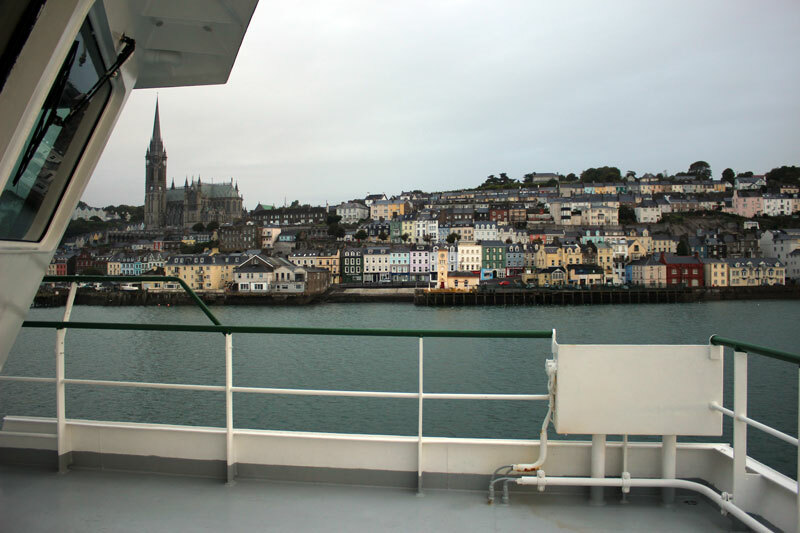 We leave Monday 17th September form Cobh in Cork. 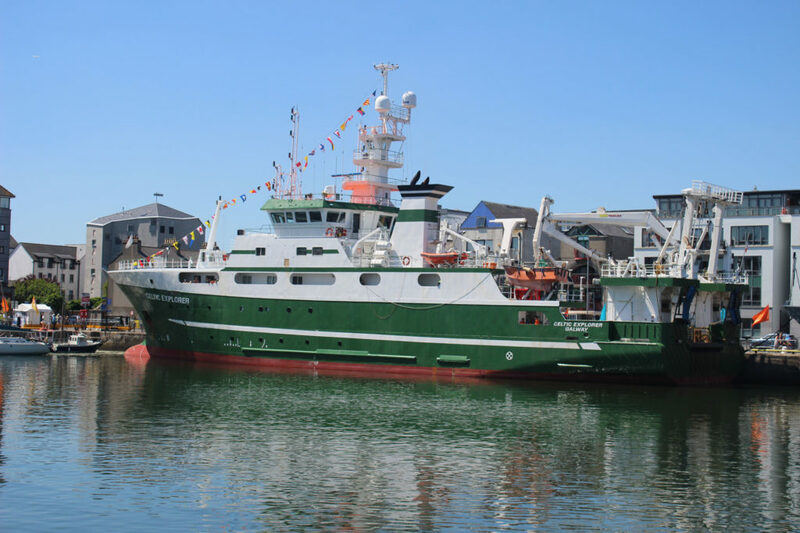 We’ll be at sea for 21 days and return to Galway on Sunday 7th October. 3. How are you getting there? We’re going out on the Celtic Explorer, the Marine Institutes largest research vessel. 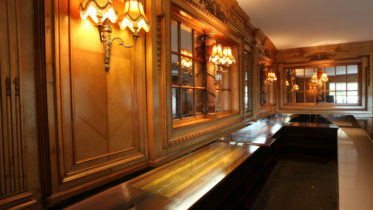 Check out this virtual tour of the ship. 4. 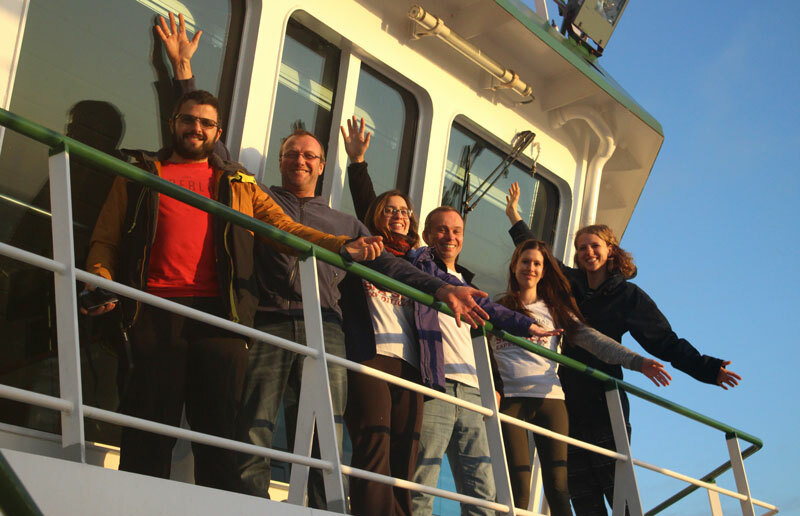 And finally – who are you and what’s your role on board the Celtic Explorer? Good question and maybe I should have started with this one – Hi I’m Daniel, I’ve been working in media and communications for a number of years and I’ve always had a love of the Irish coast. 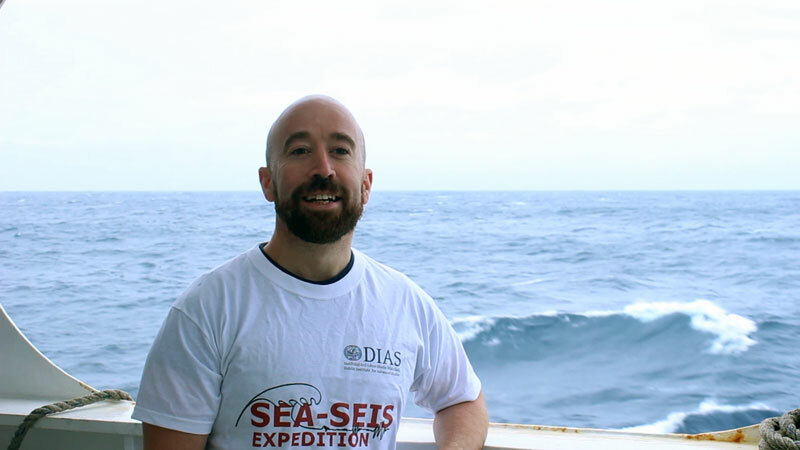 As for my role onboard, I am going to be sharing content about the scientific expedition for both the Dublin Institute for Advanced Studies and the Marine Institute. Personally though, there is one question above all I would like to answer: What’s life at sea really like? Hopefully, over the coming weeks, I’m going to find out.